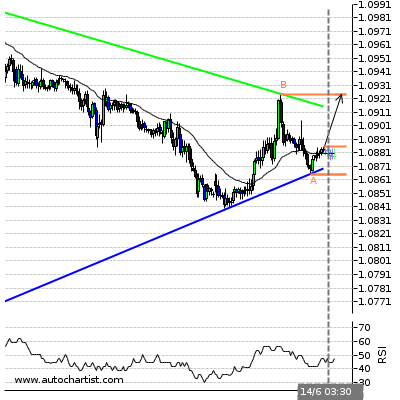 Possible bullish price movement towards the resistance 1.1092 within the next 4 hours. 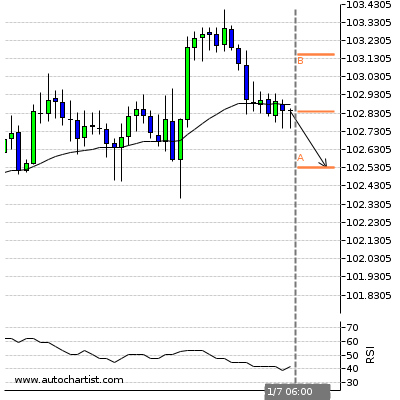 Possible bearish price movement towards the support 101.5939 within the next 4 hours. 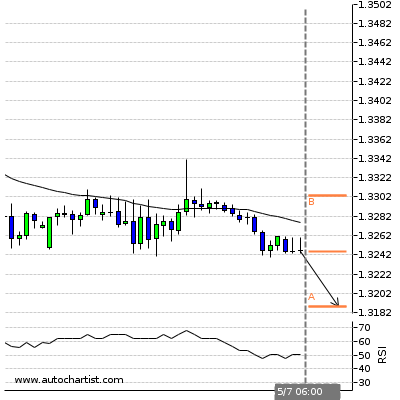 Possible bearish price movement towards the support 1.3238 within the next 4 hours. Channel Down has broken through the resistance line at 28-Jun-02:00 2016 GMT. Possible bullish price movement forecast for the next 10 hours towards 0.743. 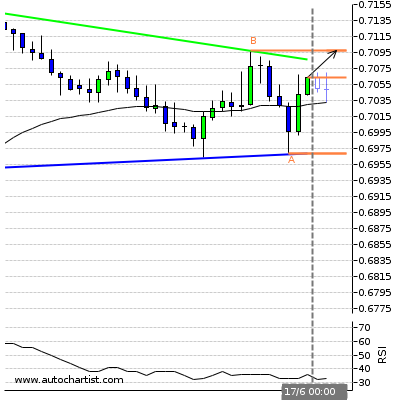 ( B ) 0.7453Last resistance turning point of Channel Down. 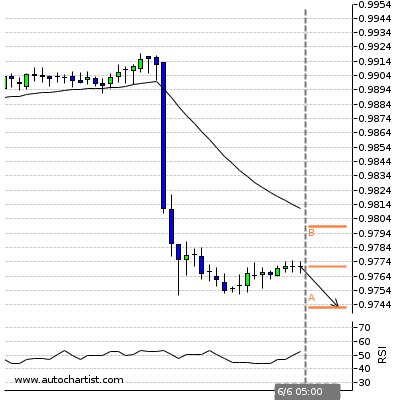 ( A ) 0.7332Last support turning point of Channel Down. Possible bullish price movement towards the resistance 0.9797 within the next 4 hours. Rising Wedge has broken through the support line at 28-Jun-02:00 2016 GMT. 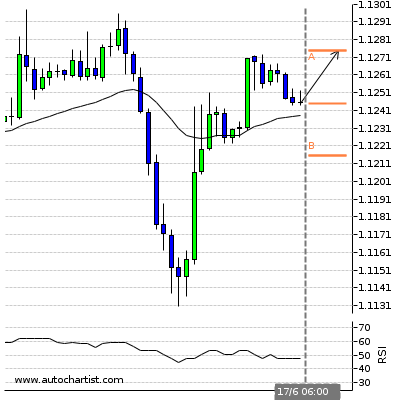 Possible bearish price movement forecast for the next 11 hours towards 1.296. 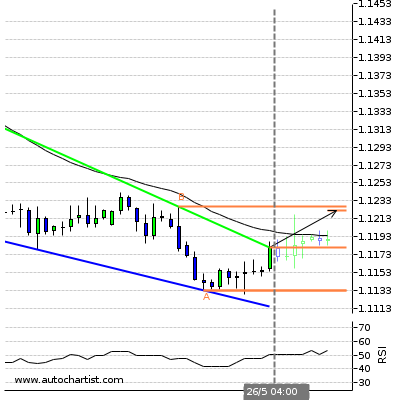 ( A ) 1.312Last resistance turning point of Rising Wedge. Triangle identified at 28-Jun-05:30 2016 GMT. This pattern is still in the process of forming. 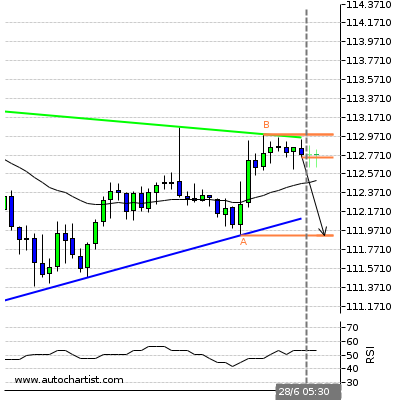 Possible bearish price movement towards the support 111.922 within the next 6 hours. ( B ) 112.991Last resistance turning point of Triangle. ( A ) 111.9225Last support turning point of Triangle. Descending Triangle identified at 27-Jun-20:00 2016 GMT. This pattern is still in the process of forming. 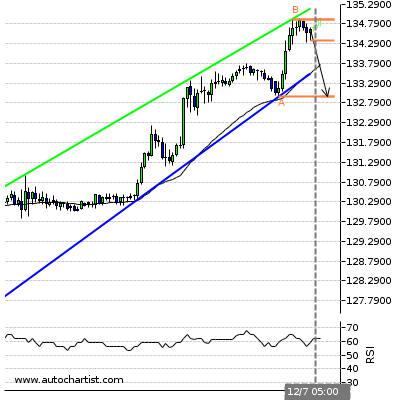 Possible bearish price movement towards the support 1.43 within the next 10 hours. 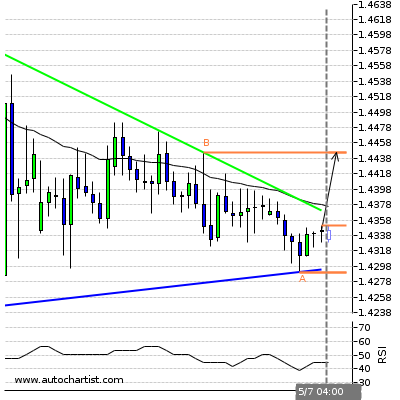 ( B ) 1.4453Last resistance turning point of Descending Triangle. 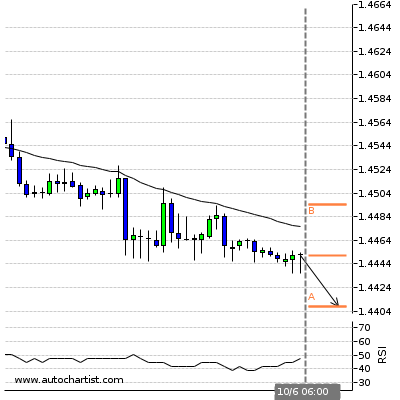 ( A ) 1.4295Last support turning point of Descending Triangle. Rising Wedge has broken through the support line at 28-Jun-05:00 2016 GMT. 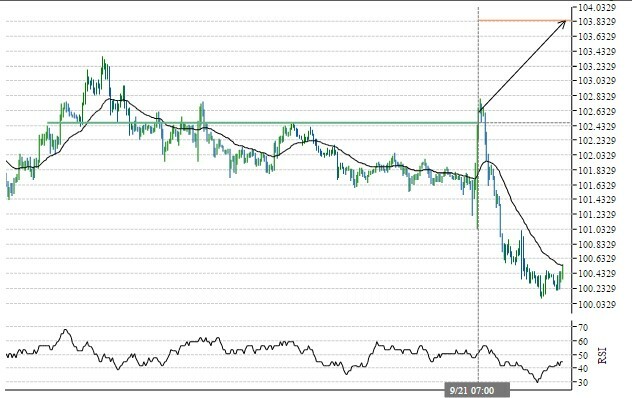 Possible bearish price movement forecast for the next 5 hours towards 1.723. ( B ) 1.7363Last resistance turning point of Rising Wedge. 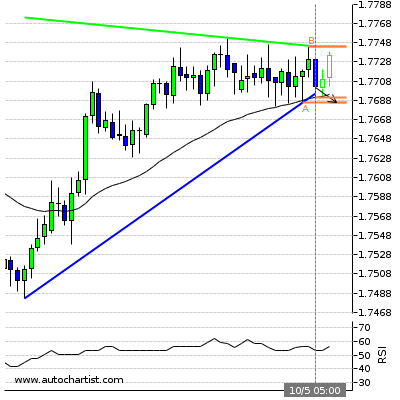 ( A ) 1.7272Last support turning point of Rising Wedge. Triangle has broken through the resistance line at 28-Jun-02:00 2016 GMT. Possible bullish price movement forecast for the next 17 hours towards 0.754. ( A ) 0.7448Last support turning point of Triangle. Triangle has broken through the support line at 28-Jun-02:00 2016 GMT. 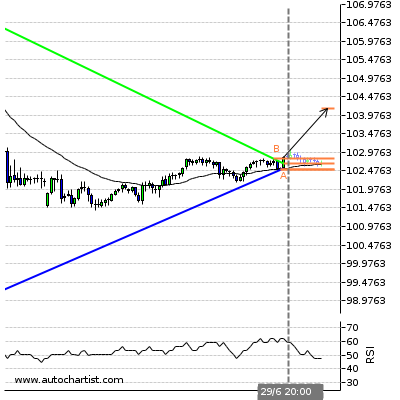 Possible bearish price movement forecast for the next 6 hours towards 17.575. 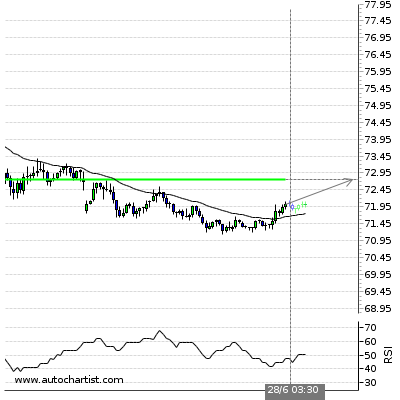 ( B ) 17.78Last resistance turning point of Triangle. 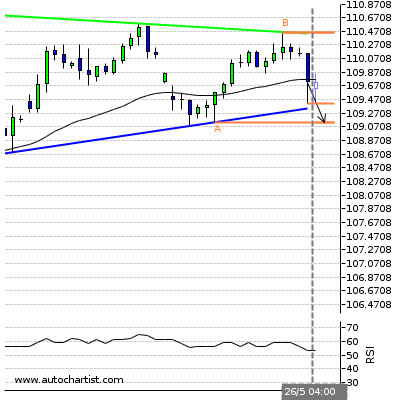 ( A ) 17.65Last support turning point of Triangle. Rising Wedge identified at 30-Jun-01:30 2016 GMT. This pattern is still in the process of forming. 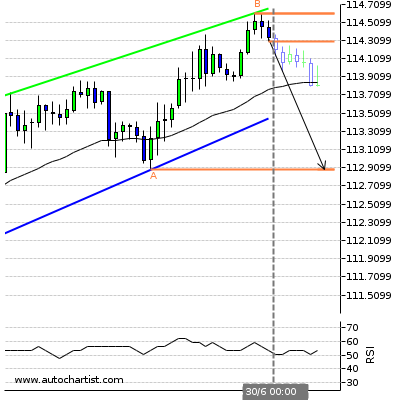 Possible bearish price movement towards the support 1.105 within the next 19 hours. 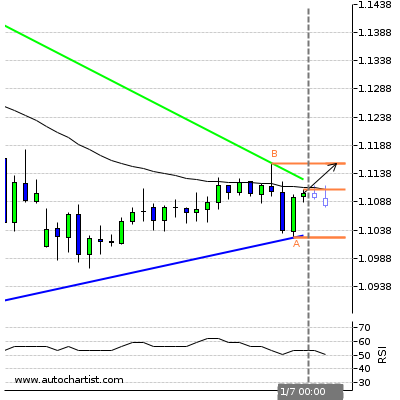 ( B ) 1.1131Last resistance turning point of Rising Wedge. 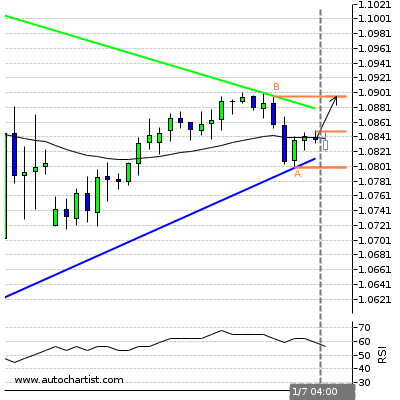 ( A ) 1.1051Last support turning point of Rising Wedge. Triangle has broken through the resistance line at 29-Jun-20:00 2016 GMT. Possible bullish price movement forecast for the next 2 days towards 104.149. ( B ) 102.816Last resistance turning point of Triangle. ( A ) 102.5055Last support turning point of Triangle. 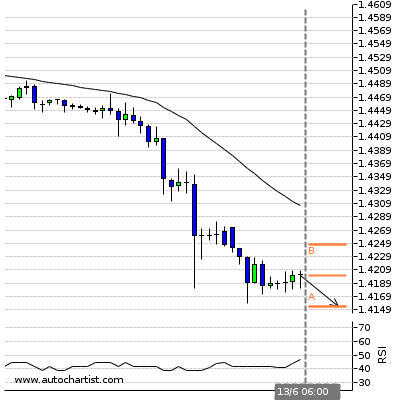 Possible bearish price movement towards the support 1.3325 within the next 4 hours. Channel Up identified at 30-Jun-02:30 2016 GMT. This pattern is still in the process of forming. Possible bearish price movement towards the support 0.734 within the next 17 hours. 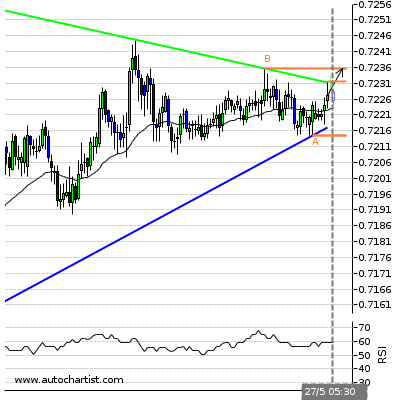 ( B ) 0.7474Last resistance turning point of Channel Up. ( A ) 0.7342Last support turning point of Channel Up. 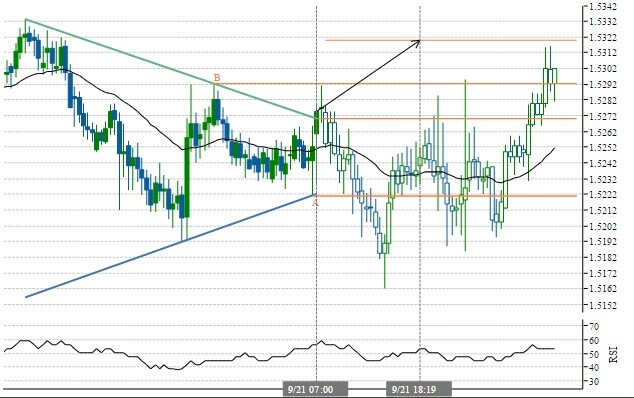 Possible bullish price movement towards the resistance 0.9841 within the next 4 hours. Channel Down identified at 30-Jun-05:00 2016 GMT. This pattern is still in the process of forming. 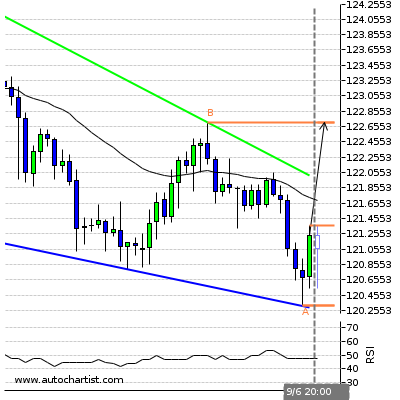 Possible bullish price movement towards the resistance 1.311 within the next 19 hours. ( B ) 1.3109Last resistance turning point of Channel Down. 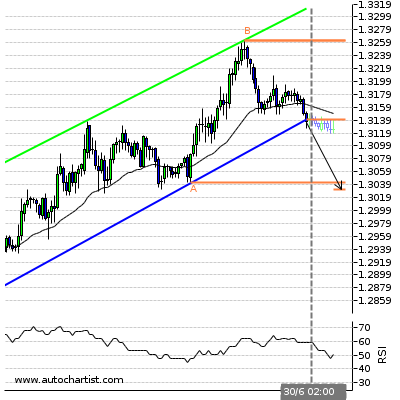 ( A ) 1.2931Last support turning point of Channel Down. 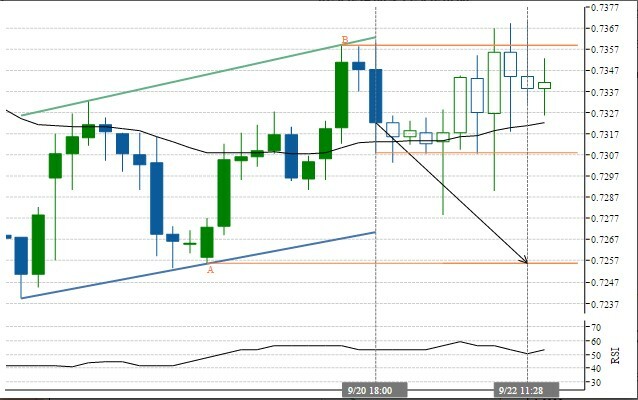 Channel Up has broken through the support line at 30-Jun-05:30 2016 GMT. 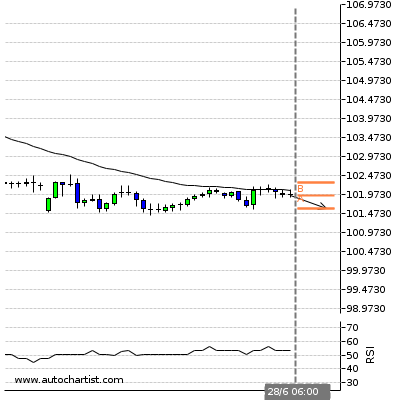 Possible bearish price movement forecast for the next 18 hours towards 0.704. ( B ) 0.7138Last resistance turning point of Channel Up. 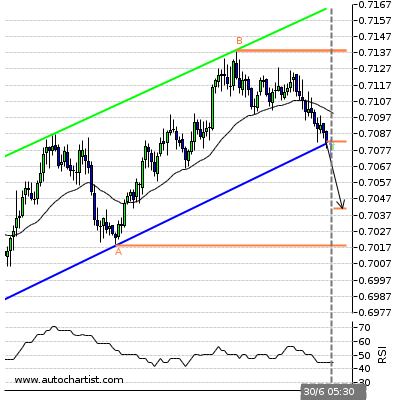 ( A ) 0.7018Last support turning point of Channel Up. Channel Up identified at 29-Jun-20:00 2016 GMT. This pattern is still in the process of forming. 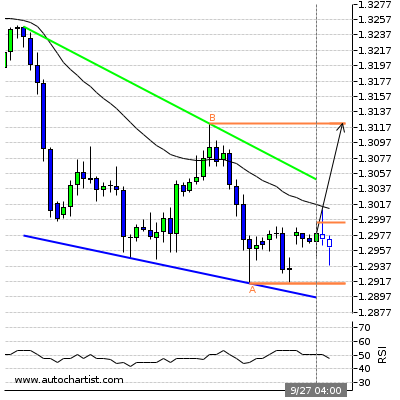 Possible bearish price movement towards the support 135.886 within the next 13 hours. ( B ) 139.0375Last resistance turning point of Channel Up. 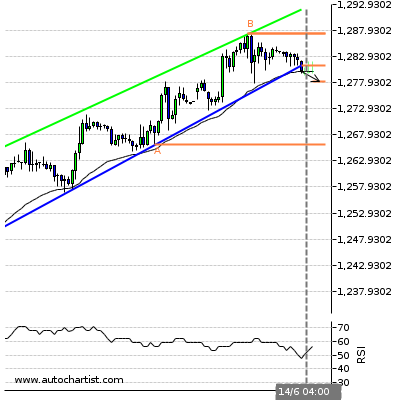 ( A ) 135.8865Last support turning point of Channel Up. Channel Up identified at 30-Jun-00:00 2016 GMT. This pattern is still in the process of forming. 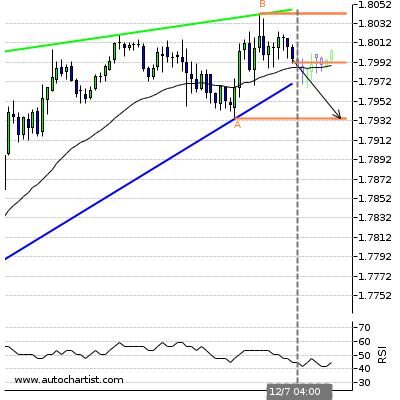 Possible bearish price movement towards the support 112.885 within the next 15 hours. ( B ) 114.605Last resistance turning point of Channel Up. 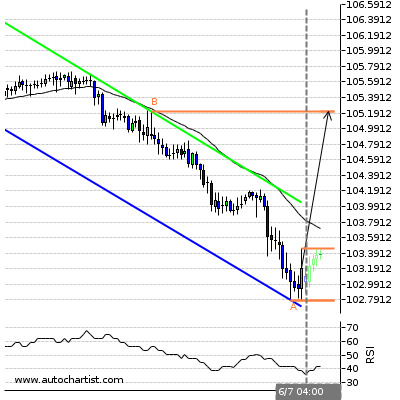 ( A ) 112.885Last support turning point of Channel Up. Channel Up has broken through the support line at 30-Jun-02:00 2016 GMT. 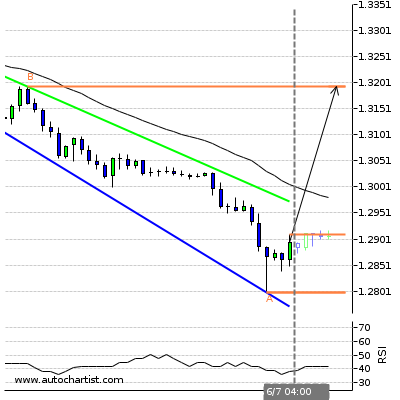 Possible bearish price movement forecast for the next 18 hours towards 1.303. ( B ) 1.3262Last resistance turning point of Channel Up. 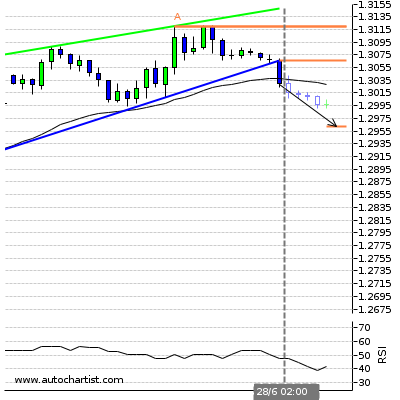 ( A ) 1.3042Last support turning point of Channel Up. Triangle has broken through the support line at 30-Jun-01:00 2016 GMT. 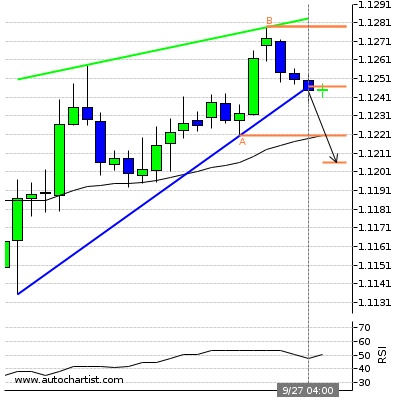 Possible bearish price movement forecast for the next 12 hours towards 1.433. 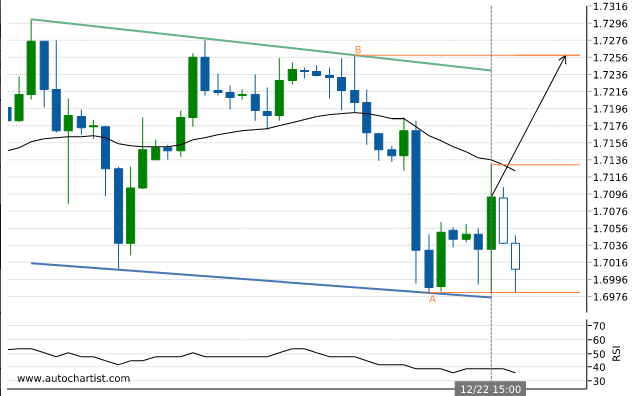 ( B ) 1.4473Last resistance turning point of Triangle. Channel Up identified at 30-Jun-02:30 2016 GMT. This pattern is still in the process of forming. 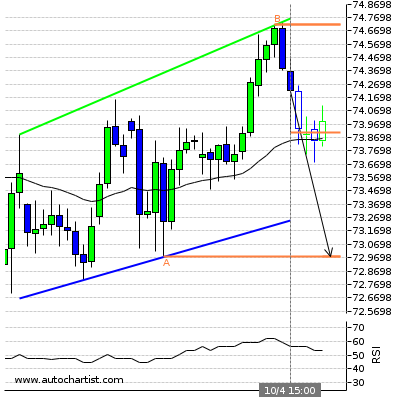 Possible bearish price movement towards the support 78.4 within the next 16 hours. ( B ) 79.59Last resistance turning point of Channel Up. ( A ) 78.3995Last support turning point of Channel Up. Rising Wedge identified at 30-Jun-04:00 2016 GMT. This pattern is still in the process of forming. 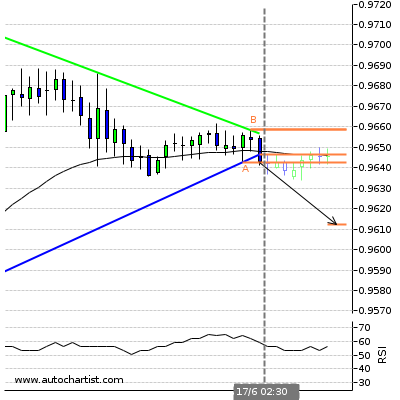 Possible bearish price movement towards the support 0.752 within the next 19 hours. 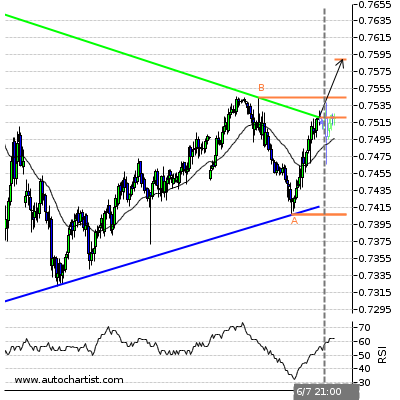 ( B ) 0.7581Last resistance turning point of Rising Wedge. ( A ) 0.752Last support turning point of Rising Wedge. Channel Up identified at 30-Jun-02:00 2016 GMT. This pattern is still in the process of forming. 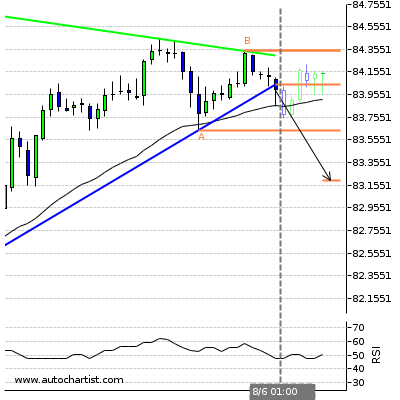 Possible bearish price movement towards the support 103.975 within the next 19 hours. ( B ) 105.245Last resistance turning point of Channel Up. 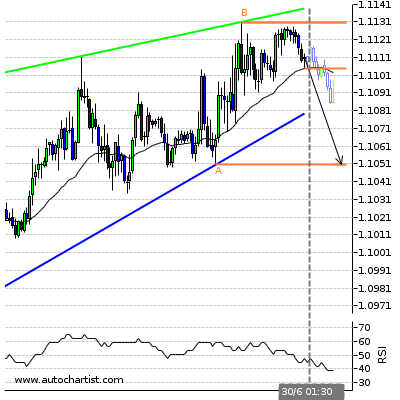 ( A ) 103.975Last support turning point of Channel Up. Triangle has broken through the support line at 29-Jun-20:00 2016 GMT. 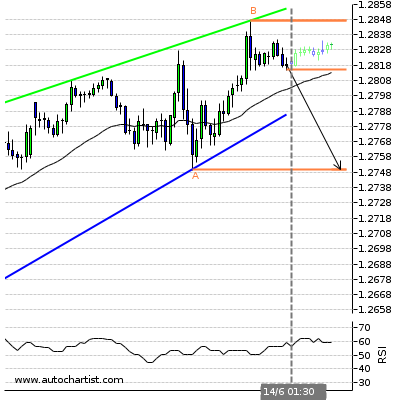 Possible bearish price movement forecast for the next 2 days towards 1,295.118. ( A ) 1326.405Last resistance turning point of Triangle. Rising Wedge identified at 30-Jun-00:00 2016 GMT. This pattern is still in the process of forming. 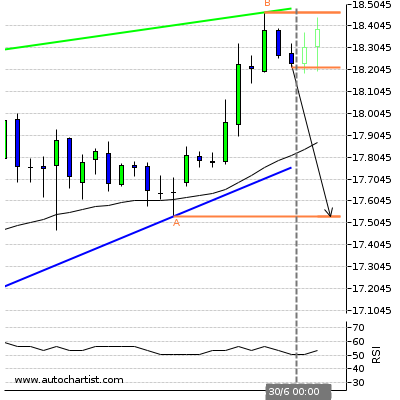 Possible bearish price movement towards the support 17.535 within the next 2 days. ( B ) 18.465Last resistance turning point of Rising Wedge. 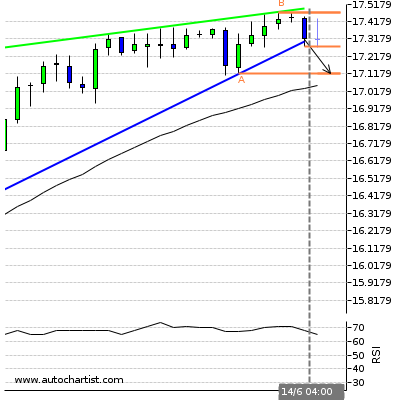 ( A ) 17.535Last support turning point of Rising Wedge. Triangle identified at 01-Jul-00:00 2016 GMT. This pattern is still in the process of forming. 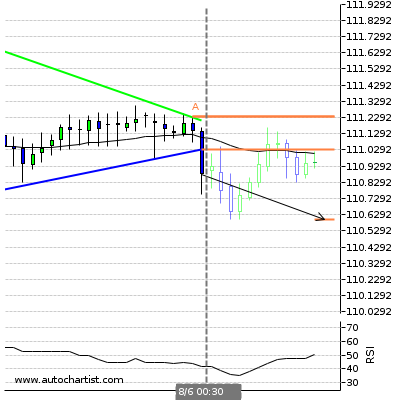 Possible bullish price movement towards the resistance 1.116 within the next 2 days. 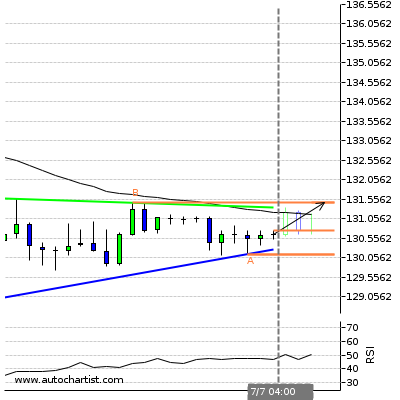 ( B ) 1.1156Last resistance turning point of Triangle. 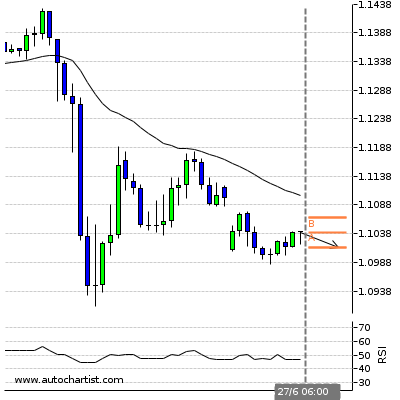 ( A ) 1.1024Last support turning point of Triangle. 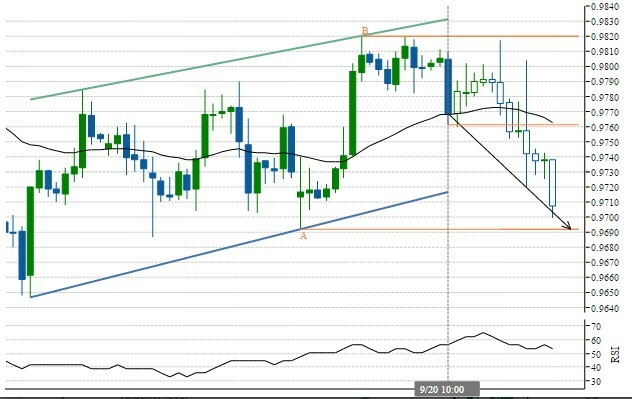 Possible bearish price movement towards the support 102.5295 within the next 4 hours. 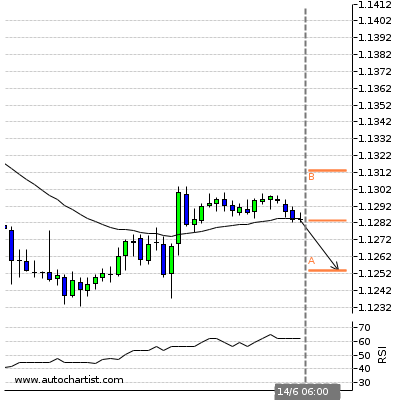 Possible bearish price movement towards the support 1.322 within the next 4 hours. Triangle identified at 01-Jul-05:30 2016 GMT. This pattern is still in the process of forming. Possible bullish price movement towards the resistance 0.98 within the next 7 hours. 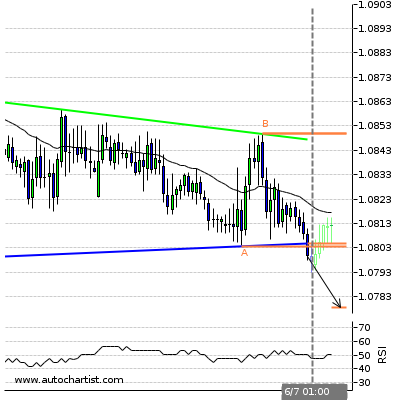 ( B ) 0.98Last resistance turning point of Triangle. ( A ) 0.9759Last support turning point of Triangle. Triangle has broken through the support line at 30-Jun-20:00 2016 GMT. 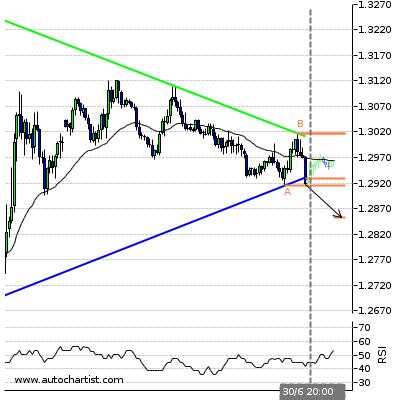 Possible bearish price movement forecast for the next 2 days towards 1.285. ( B ) 1.3017Last resistance turning point of Triangle. ( A ) 1.2915Last support turning point of Triangle. Triangle has broken through the resistance line at 01-Jul-00:00 2016 GMT. 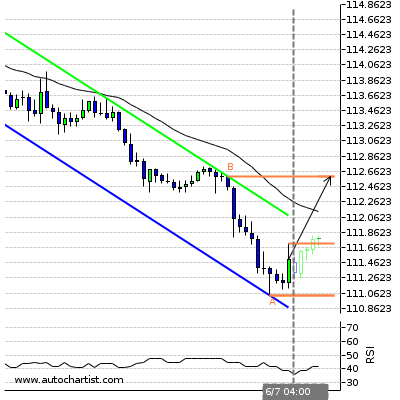 Possible bullish price movement forecast for the next 2 days towards 145.071. ( B ) 138.42Last resistance turning point of Triangle. ( A ) 136.0075Last support turning point of Triangle. Triangle identified at 01-Jul-04:00 2016 GMT. This pattern is still in the process of forming. 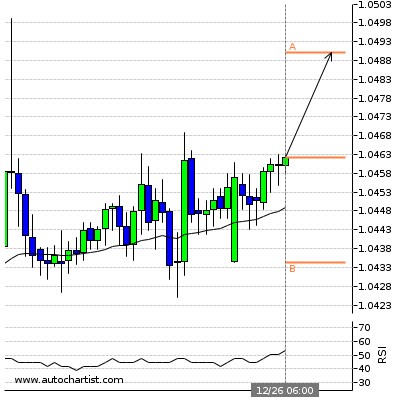 Possible bullish price movement towards the resistance 1.09 within the next 2 days. 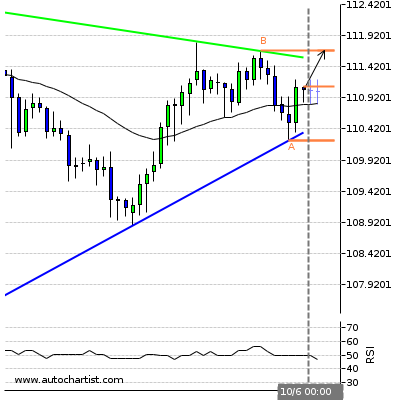 ( B ) 1.0896Last resistance turning point of Triangle. 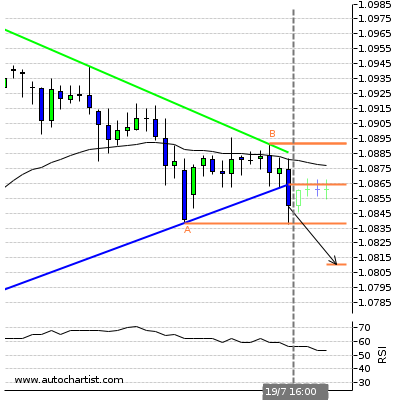 ( A ) 1.0799Last support turning point of Triangle. Triangle identified at 01-Jul-00:00 2016 GMT. This pattern is still in the process of forming. 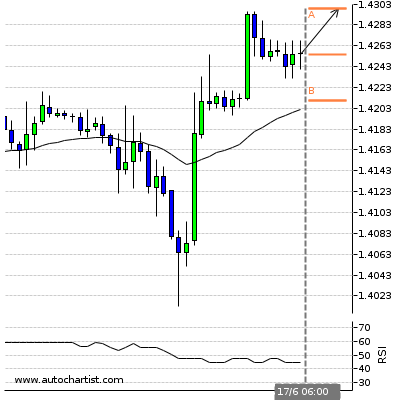 Possible bullish price movement towards the resistance 1.445 within the next 2 days. ( B ) 1.4446Last resistance turning point of Triangle. 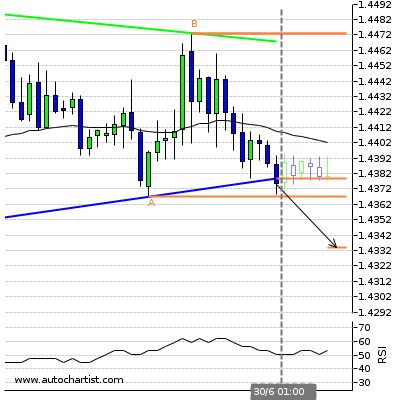 ( A ) 1.4324Last support turning point of Triangle. Channel Down identified at 30-Jun-20:00 2016 GMT. This pattern is still in the process of forming. 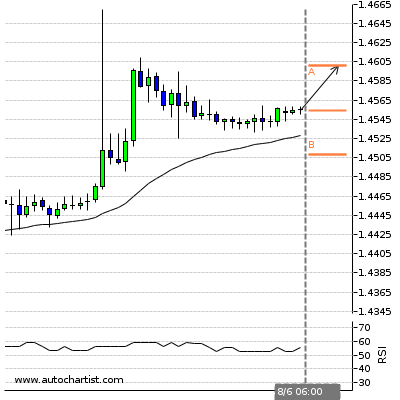 Possible bullish price movement towards the resistance 1.571 within the next 15 hours. 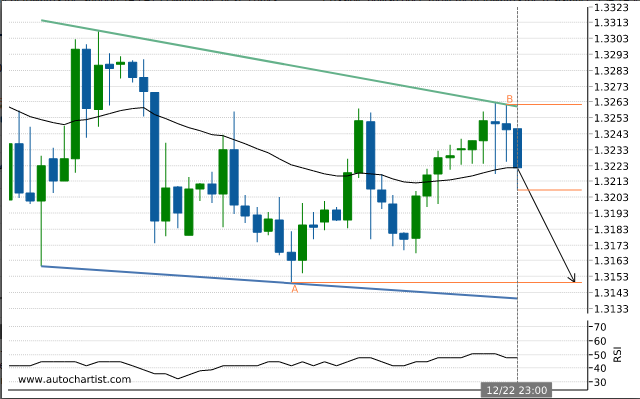 ( B ) 1.5712Last resistance turning point of Channel Down. 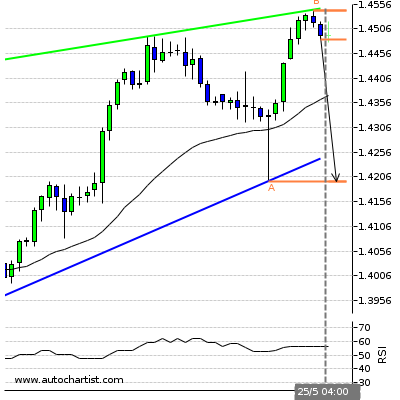 ( A ) 1.5489Last support turning point of Channel Down. Channel Up identified at 01-Jul-01:00 2016 GMT. This pattern is still in the process of forming. 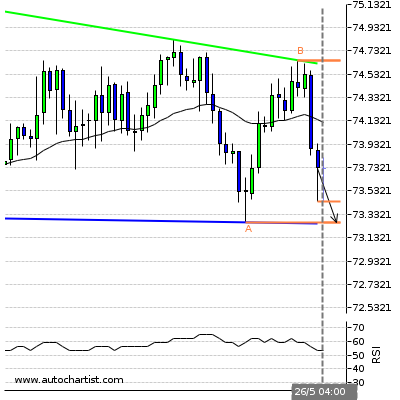 Possible bearish price movement towards the support 78.808 within the next 13 hours. 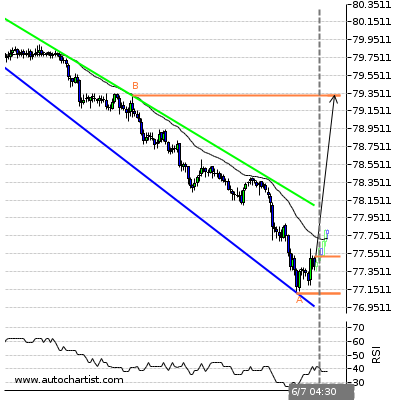 ( B ) 79.969Last resistance turning point of Channel Up. 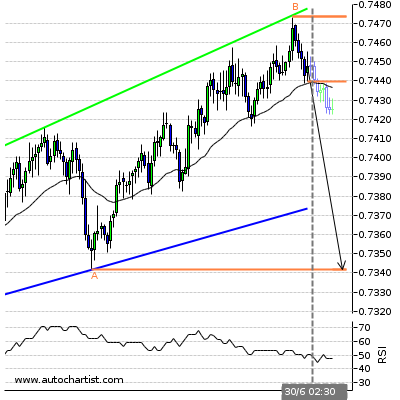 ( A ) 78.808Last support turning point of Channel Up. Descending Triangle identified at 01-Jul-03:00 2016 GMT. This pattern is still in the process of forming. 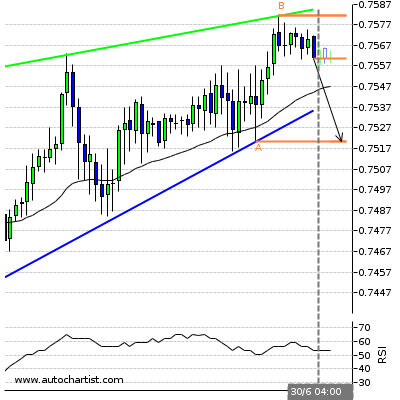 Possible bearish price movement towards the support 0.749 within the next 19 hours. 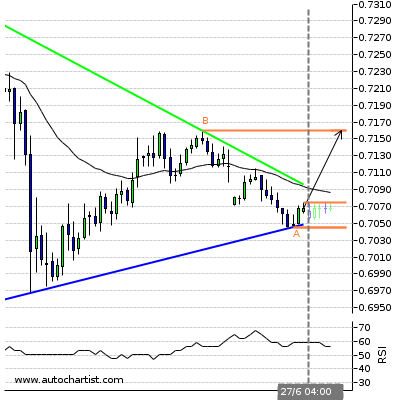 ( B ) 0.7565Last resistance turning point of Descending Triangle. ( A ) 0.7486Last support turning point of Descending Triangle. Channel Up identified at 01-Jul-00:00 2016 GMT. This pattern is still in the process of forming. 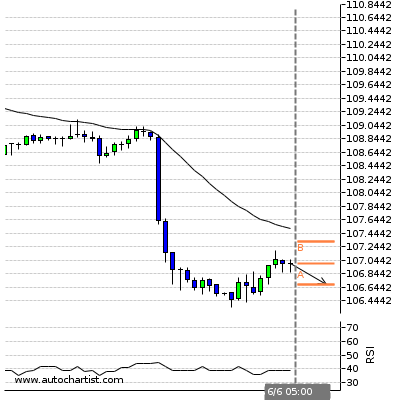 Possible bearish price movement towards the support 104.28 within the next 18 hours. ( B ) 106.04Last resistance turning point of Channel Up. 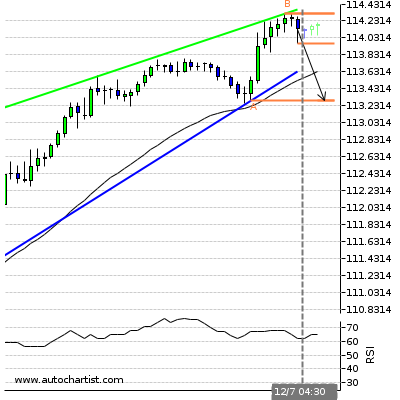 ( A ) 104.28Last support turning point of Channel Up. 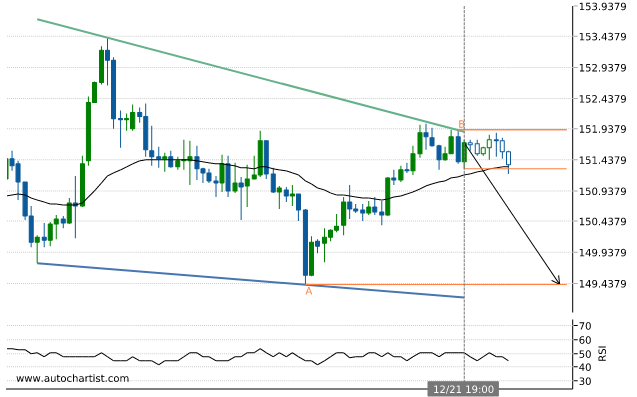 Triangle has broken through the resistance line at 30-Jun-12:00 2016 GMT. 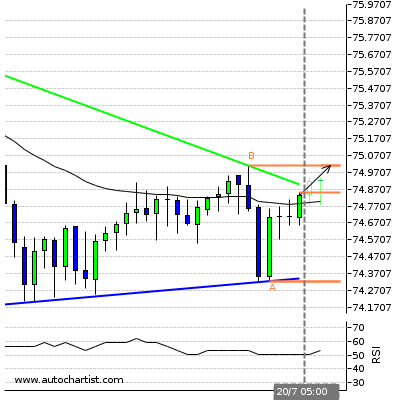 Possible bullish price movement forecast for the next 2 days towards 74.51. ( A ) 72.3475Last support turning point of Triangle. 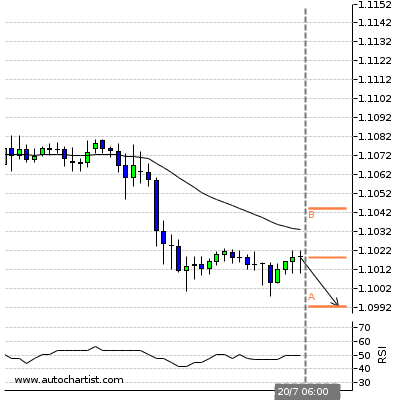 Possible bearish price movement towards the support 1.1096 within the next 4 hours. 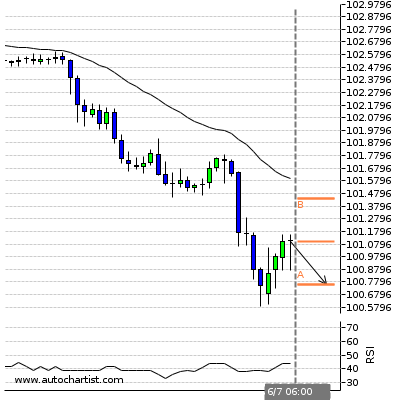 Possible bearish price movement towards the support 101.7701 within the next 4 hours. 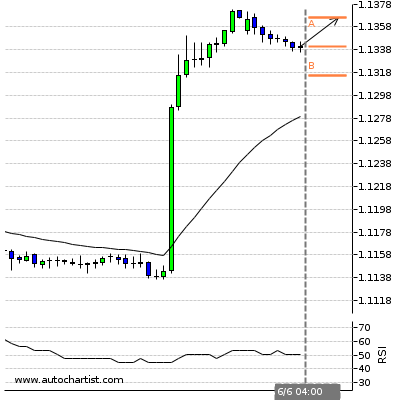 Possible bearish price movement towards the support 1.3188 within the next 4 hours. Channel Up identified at 04-Jul-22:00 2016 GMT. This pattern is still in the process of forming. 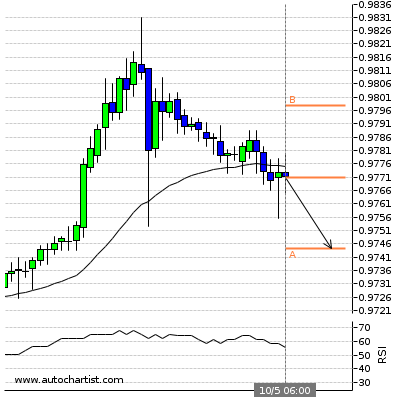 Possible bearish price movement towards the support 0.737 within the next 2 days. 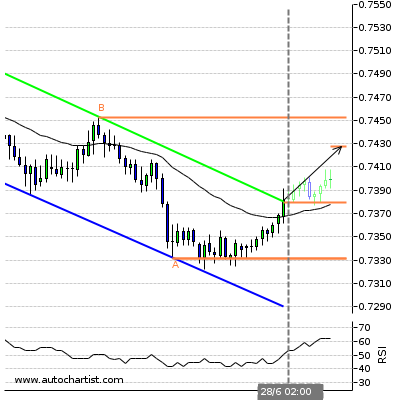 ( B ) 0.7546Last resistance turning point of Channel Up. 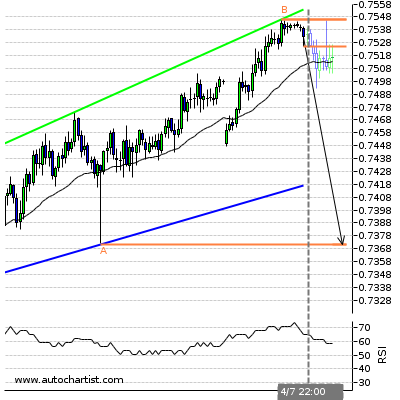 ( A ) 0.7371Last support turning point of Channel Up. Falling Wedge identified at 04-Jul-23:00 2016 GMT. This pattern is still in the process of forming. 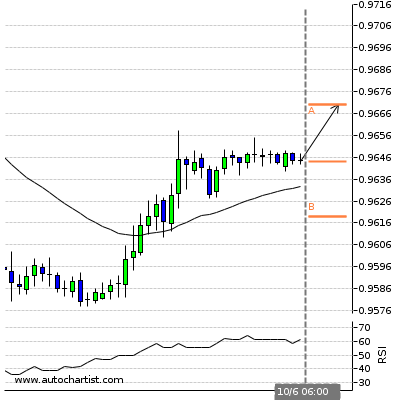 Possible bullish price movement towards the resistance 0.976 within the next 13 hours. 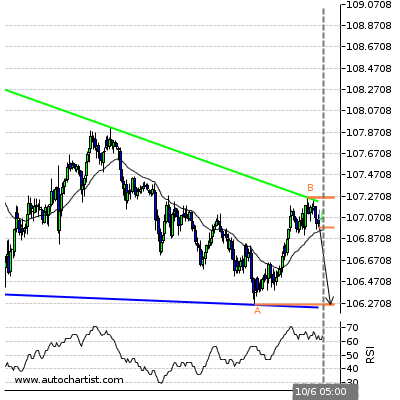 ( B ) 0.976Last resistance turning point of Falling Wedge. ( A ) 0.9701Last support turning point of Falling Wedge. Flag identified at 05-Jul-04:00 2016 GMT. This pattern is still in the process of forming. 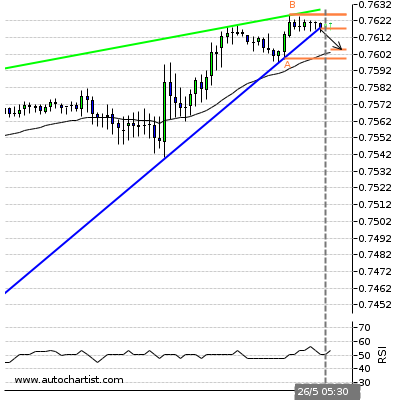 Possible bearish price movement towards the support 0.706 within the next 2 days. 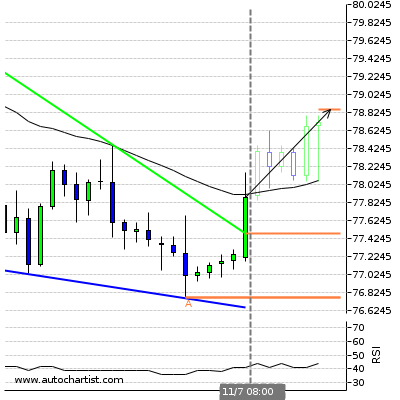 ( B ) 0.7244Last resistance turning point of Flag. 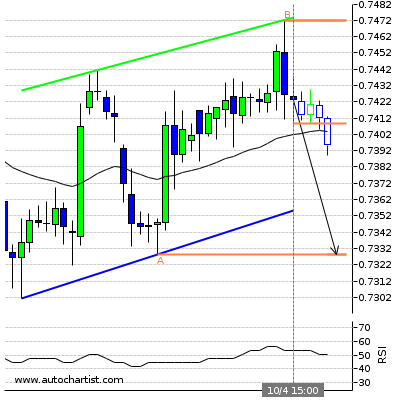 ( A ) 0.7058Last support turning point of Flag. Triangle identified at 05-Jul-04:00 2016 GMT. This pattern is still in the process of forming. 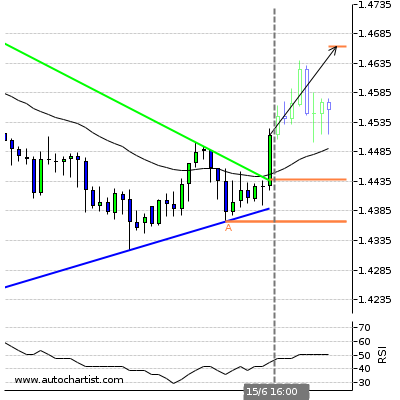 Possible bullish price movement towards the resistance 1.445 within the next 3 days. 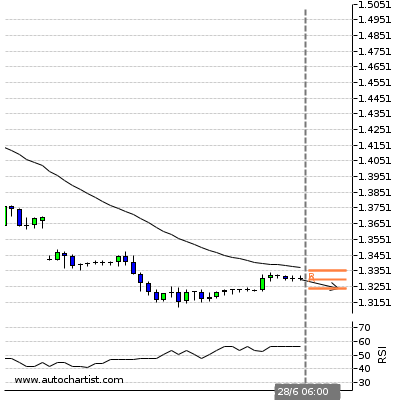 ( A ) 1.4291Last support turning point of Triangle. Falling Wedge has broken through the resistance line at 05-Jul-00:00 2016 GMT. 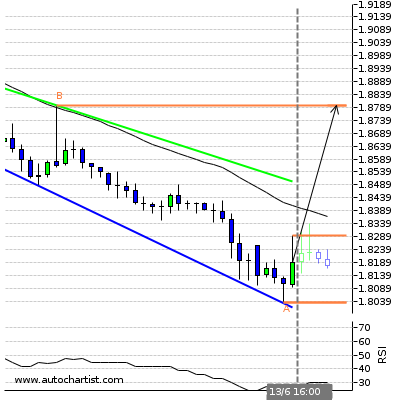 Possible bullish price movement forecast for the next 18 hours towards 1.846. 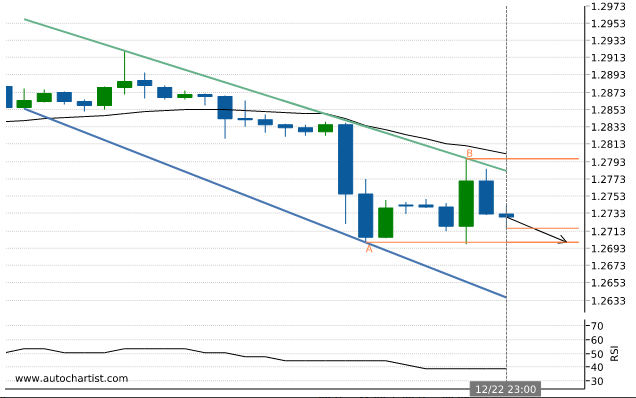 ( B ) 1.8543Last resistance turning point of Falling Wedge. 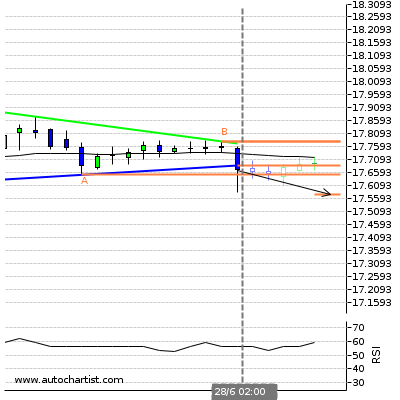 ( A ) 1.8355Last support turning point of Falling Wedge. 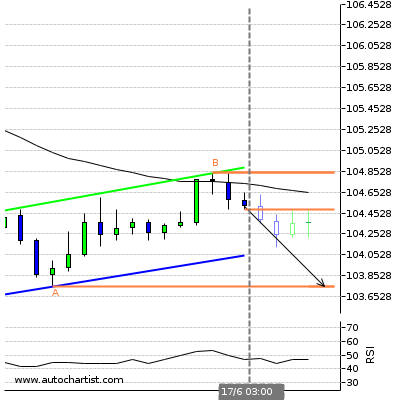 Channel Up has broken through the support line at 05-Jul-01:30 2016 GMT. 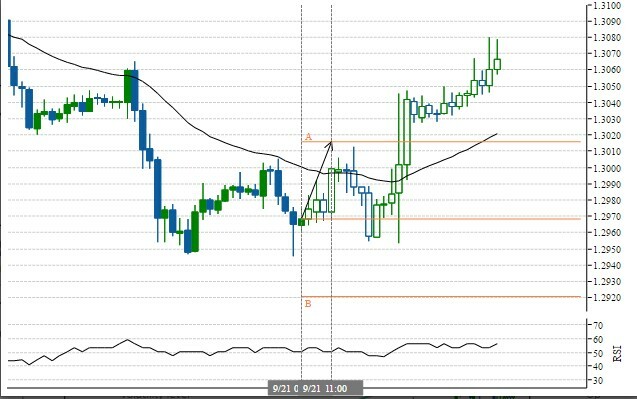 Possible bearish price movement forecast for the next 8 hours towards 104.857. 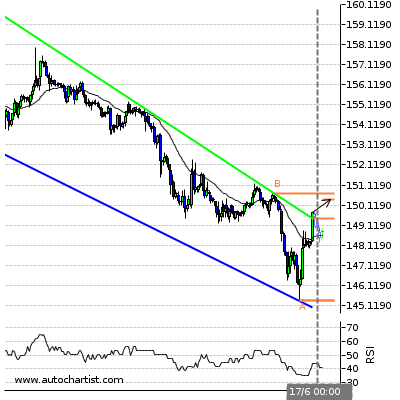 ( A ) 105.73Last resistance turning point of Channel Up. Channel Down identified at 05-Jul-04:30 2016 GMT. This pattern is still in the process of forming. 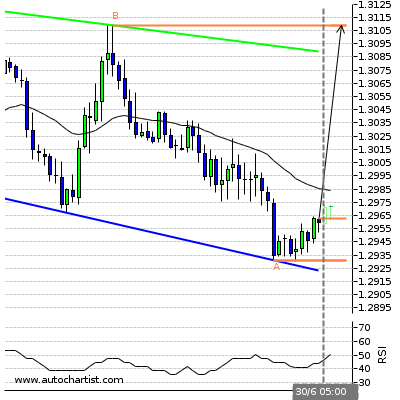 Possible bullish price movement towards the resistance 1,352.215 within the next 6 hours. ( B ) 1352.215Last resistance turning point of Channel Down. 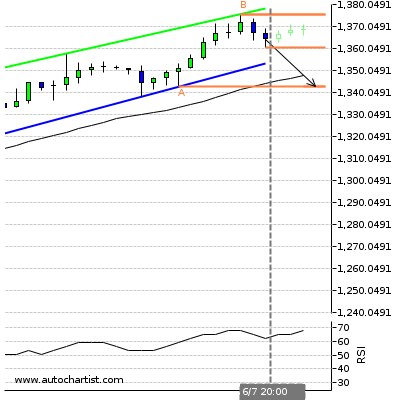 ( A ) 1338.3Last support turning point of Channel Down. Channel Down identified at 05-Jul-04:45 2016 GMT. This pattern is still in the process of forming. Possible bullish price movement towards the resistance 20.455 within the next 7 hours. ( B ) 20.455Last resistance turning point of Channel Down. ( A ) 19.53Last support turning point of Channel Down. 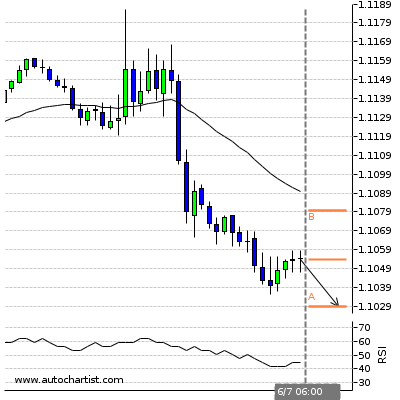 Possible bearish price movement towards the support 1.1029 within the next 4 hours. 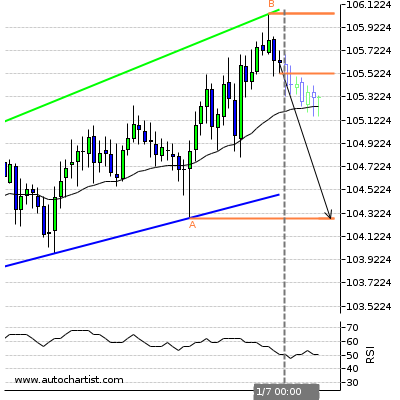 Possible bearish price movement towards the support 100.7613 within the next 4 hours. Channel Down identified at 06-Jul-04:00 2016 GMT. This pattern is still in the process of forming. 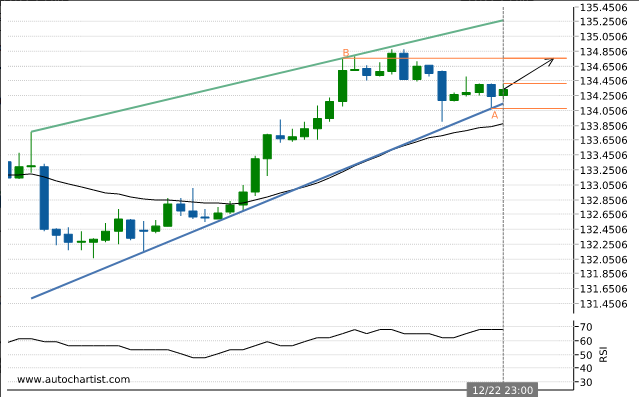 Possible bullish price movement towards the resistance 1.319 within the next 7 hours. 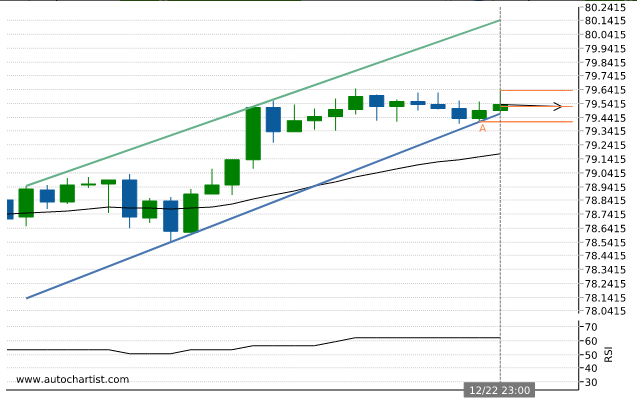 ( B ) 1.3192Last resistance turning point of Channel Down. 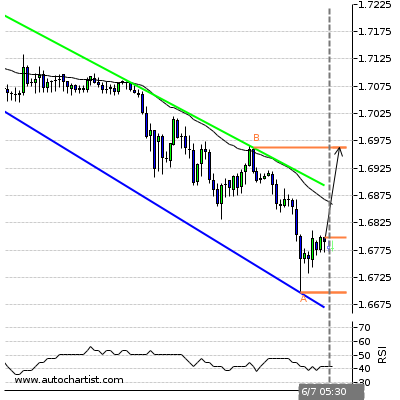 ( A ) 1.2798Last support turning point of Channel Down. 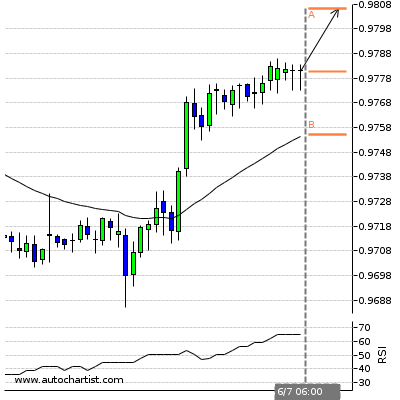 Possible bullish price movement towards the resistance 0.9806 within the next 4 hours. Channel Down identified at 06-Jul-05:00 2016 GMT. This pattern is still in the process of forming. 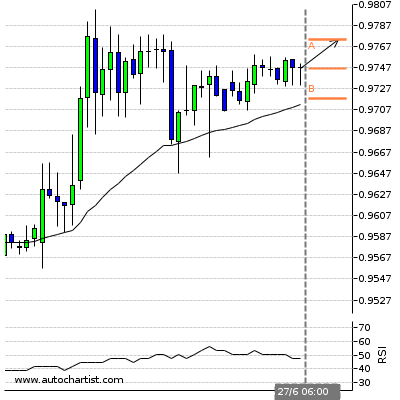 Possible bullish price movement towards the resistance 0.716 within the next 8 hours. 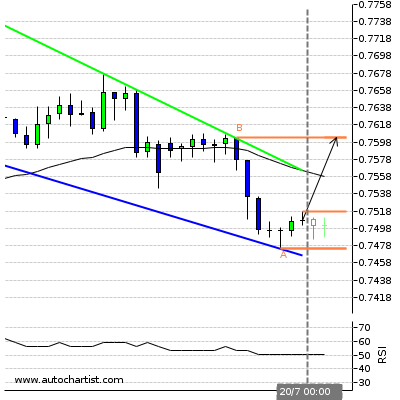 ( B ) 0.7157Last resistance turning point of Channel Down. 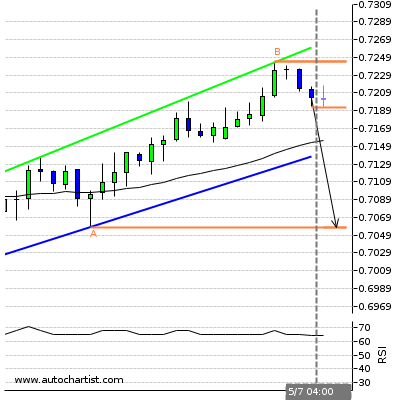 ( A ) 0.7081Last support turning point of Channel Down. Channel Down identified at 06-Jul-04:00 2016 GMT. This pattern is still in the process of forming. 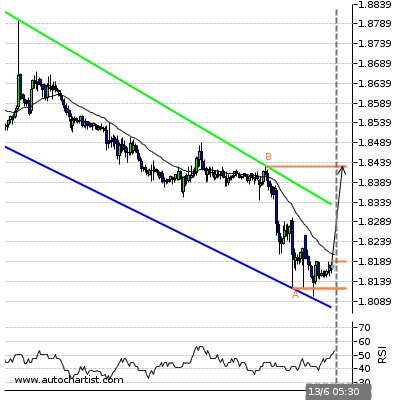 Possible bullish price movement towards the resistance 112.595 within the next 8 hours. ( B ) 112.595Last resistance turning point of Channel Down. 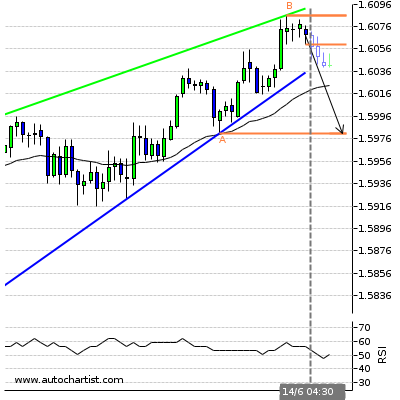 ( A ) 111.0335Last support turning point of Channel Down. 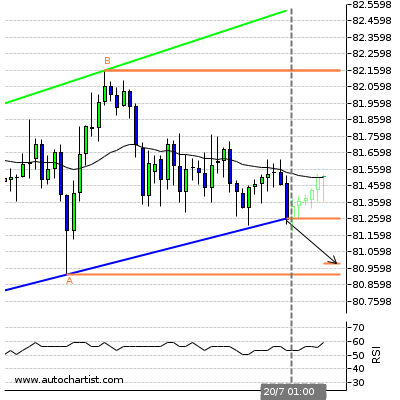 Triangle has broken through the support line at 06-Jul-01:00 2016 GMT. 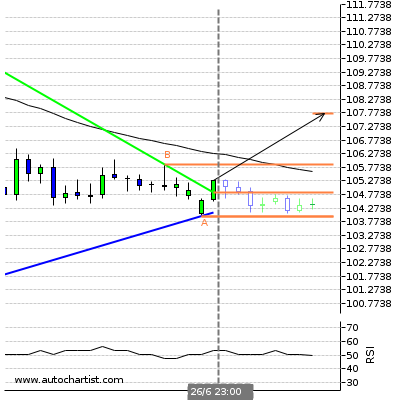 Possible bearish price movement forecast for the next 2 days towards 1.078. 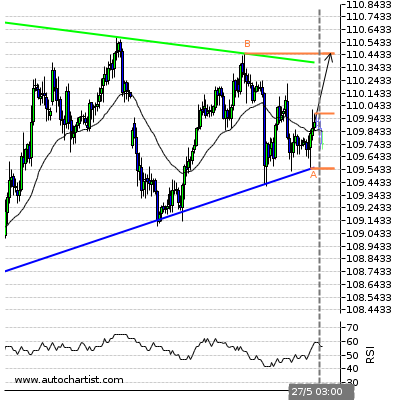 ( B ) 1.085Last resistance turning point of Triangle. 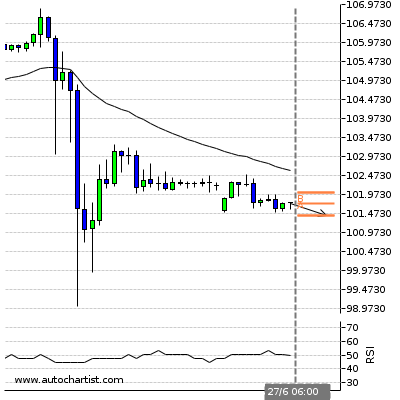 ( A ) 1.0804Last support turning point of Triangle. Channel Down identified at 06-Jul-05:30 2016 GMT. This pattern is still in the process of forming. 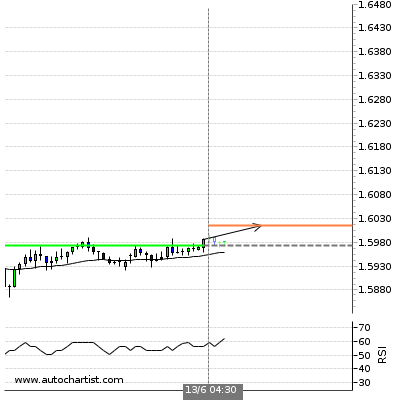 Possible bullish price movement towards the resistance 1.696 within the next 13 hours. ( B ) 1.6963Last resistance turning point of Channel Down. 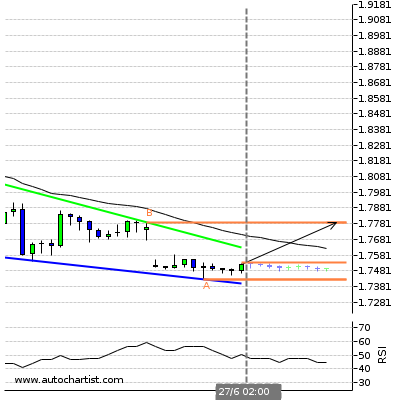 ( A ) 1.6698Last support turning point of Channel Down. Falling Wedge has broken through the resistance line at 06-Jul-04:00 2016 GMT. 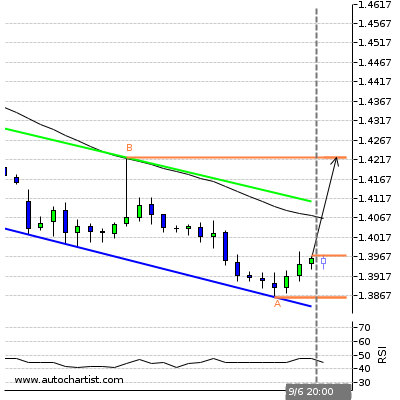 Possible bullish price movement forecast for the next 3 days towards 1.57. 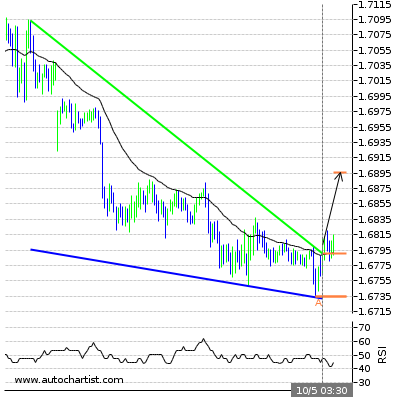 ( B ) 1.5712Last resistance turning point of Falling Wedge. 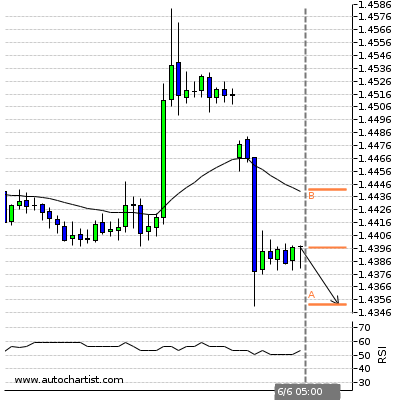 ( A ) 1.5387Last support turning point of Falling Wedge. Channel Down identified at 06-Jul-04:30 2016 GMT. This pattern is still in the process of forming. 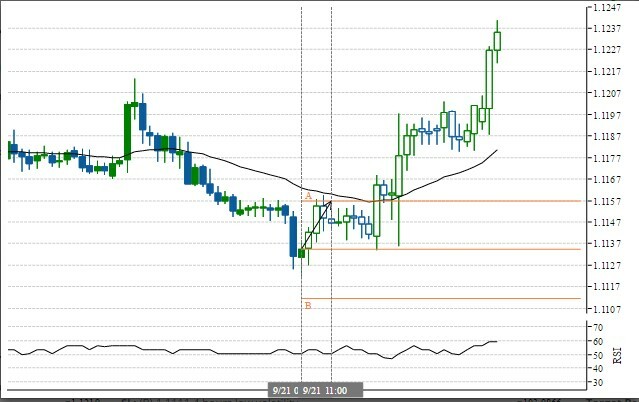 Possible bullish price movement towards the resistance 79.32 within the next 12 hours. ( B ) 79.32Last resistance turning point of Channel Down. 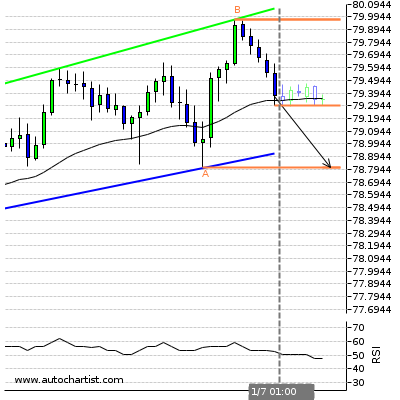 ( A ) 77.105Last support turning point of Channel Down. Triangle identified at 06-Jul-04:00 2016 GMT. This pattern is still in the process of forming. 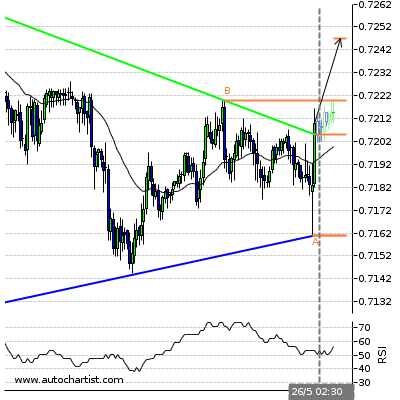 Possible bullish price movement towards the resistance 0.755 within the next 11 hours. 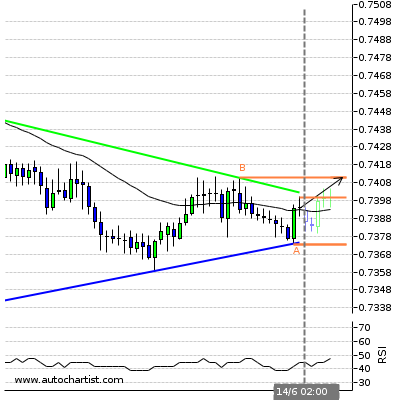 ( B ) 0.7551Last resistance turning point of Triangle. ( A ) 0.7495Last support turning point of Triangle. Channel Down identified at 06-Jul-04:00 2016 GMT. This pattern is still in the process of forming. 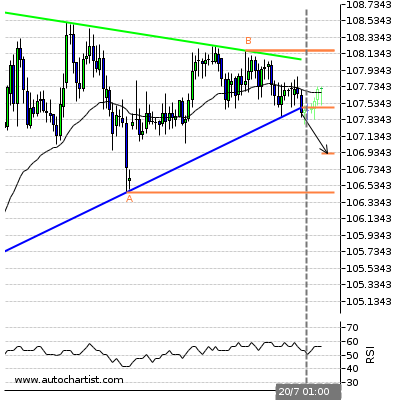 Possible bullish price movement towards the resistance 105.215 within the next 14 hours. ( B ) 105.215Last resistance turning point of Channel Down. ( A ) 102.787Last support turning point of Channel Down. Channel Up identified at 06-Jul-05:30 2016 GMT. This pattern is still in the process of forming. 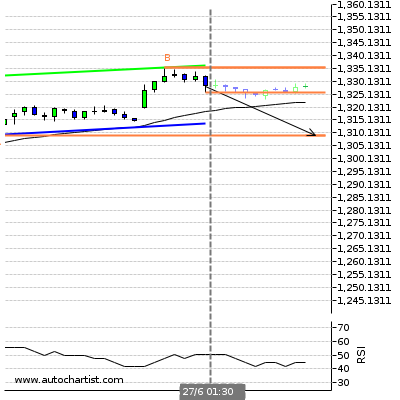 Possible bearish price movement towards the support 1,342.39 within the next 2 days. ( B ) 1371.25Last resistance turning point of Channel Up. 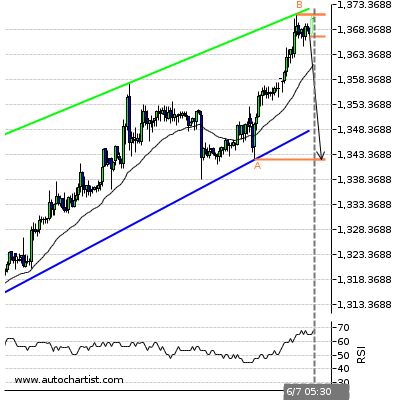 ( A ) 1342.39Last support turning point of Channel Up. 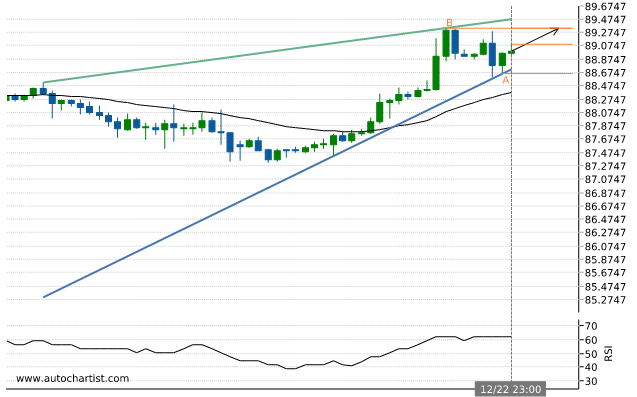 Possible bullish price movement towards the resistance 1.1132 within the next 4 hours. 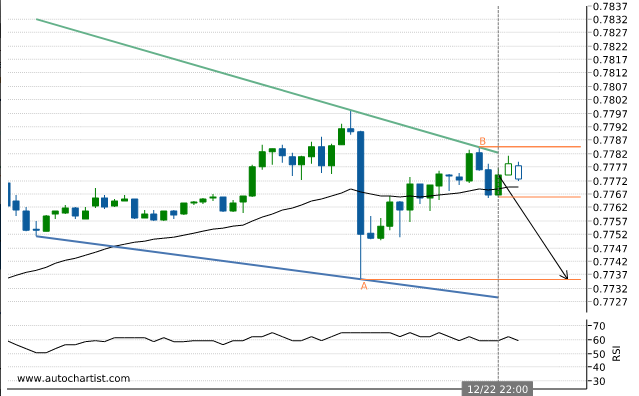 Possible bearish price movement towards the support 100.2663 within the next 4 hours. 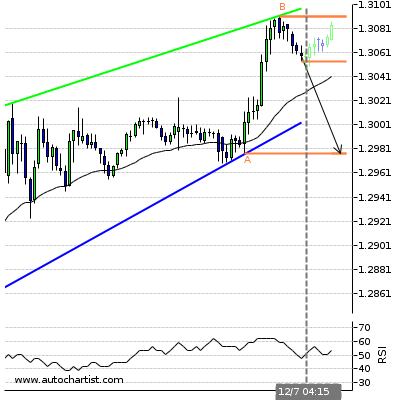 Possible bullish price movement towards the resistance 1.3034 within the next 4 hours. Triangle has broken through the resistance line at 06-Jul-21:00 2016 GMT. 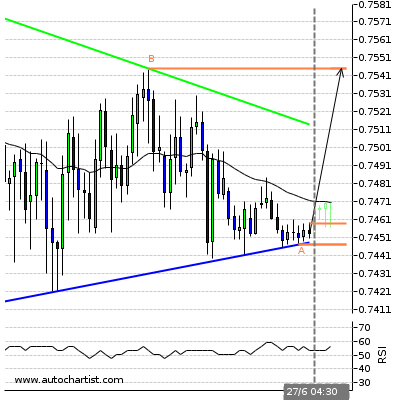 Possible bullish price movement forecast for the next 4 days towards 0.759. Pennant identified at 07-Jul-04:00 2016 GMT. This pattern is still in the process of forming. 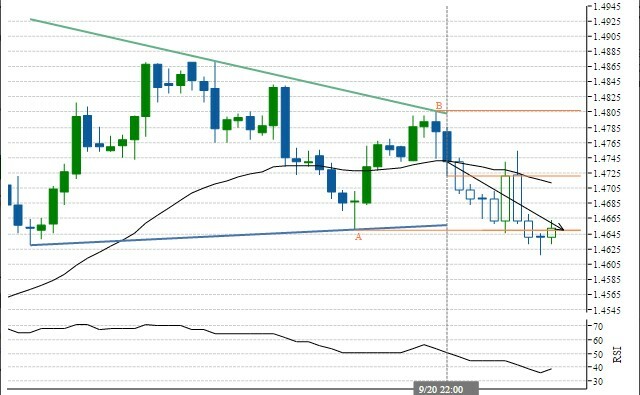 Possible bullish price movement towards the resistance 131.463 within the next 8 hours. ( B ) 131.463Last resistance turning point of Pennant. ( A ) 130.141Last support turning point of Pennant. 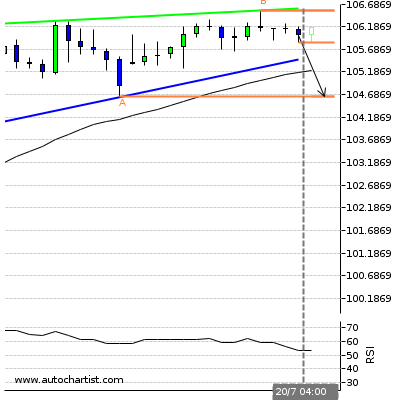 Triangle has broken through the support line at 07-Jul-05:45 2016 GMT. 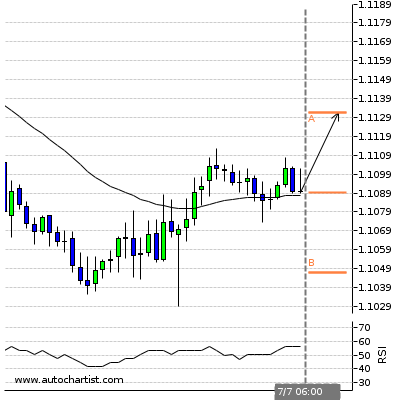 Possible bearish price movement forecast for the next 6 hours towards 111.24. ( B ) 112.265Last resistance turning point of Triangle. ( A ) 111.5825Last support turning point of Triangle. Descending Triangle identified at 07-Jul-04:00 2016 GMT. This pattern is still in the process of forming. 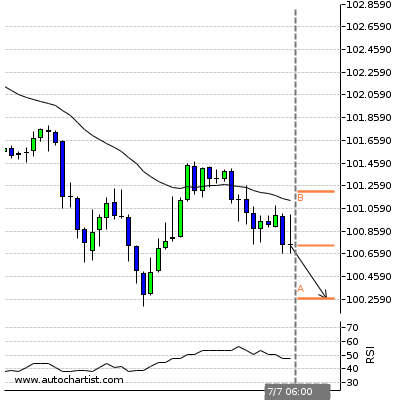 Possible bearish price movement towards the support 1.079 within the next 2 days. 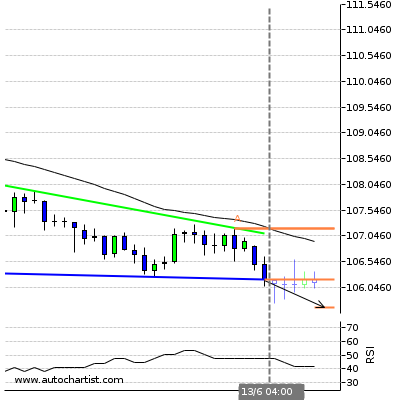 ( B ) 1.0841Last resistance turning point of Descending Triangle. 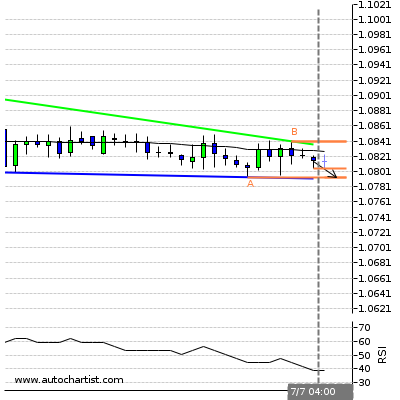 ( A ) 1.0793Last support turning point of Descending Triangle. Triangle has broken through the resistance line at 07-Jul-05:00 2016 GMT. 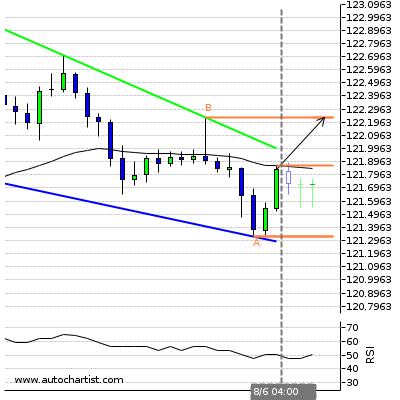 Possible bullish price movement forecast for the next 10 hours towards 1.271. ( B ) 1.273Last resistance turning point of Triangle. ( A ) 1.2559Last support turning point of Triangle. Triangle has broken through the support line at 07-Jul-05:30 2016 GMT. 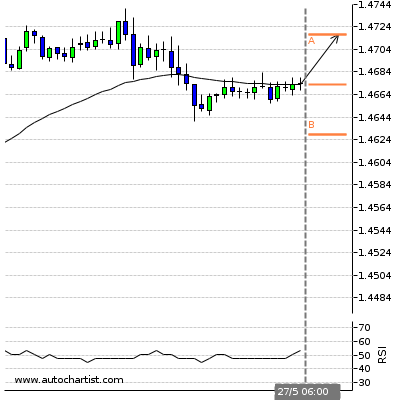 Possible bearish price movement forecast for the next 6 hours towards 1.435. 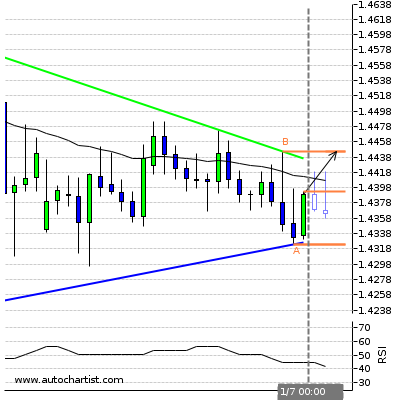 ( A ) 1.4388Last resistance turning point of Triangle. Rectangle identified at 06-Jul-20:00 2016 GMT. This pattern is still in the process of forming. 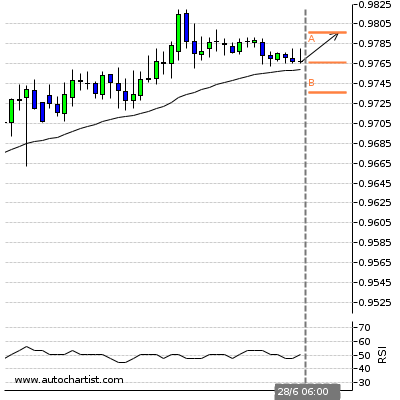 Possible bullish price movement towards the resistance 0.758 within the next 2 days. 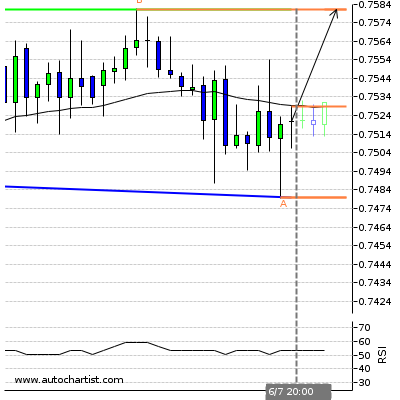 ( B ) 0.7581Last resistance turning point of Rectangle. ( A ) 0.748Last support turning point of Rectangle. Triangle identified at 07-Jul-05:00 2016 GMT. This pattern is still in the process of forming. 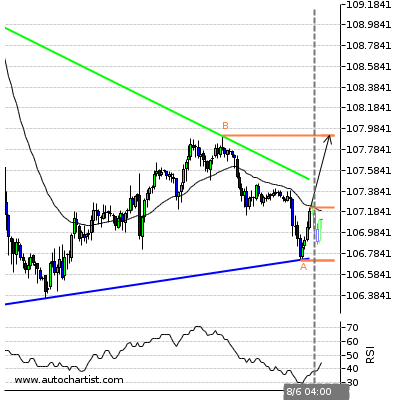 Possible bullish price movement towards the resistance 105.196 within the next 17 hours. ( B ) 105.1955Last resistance turning point of Triangle. Channel Up identified at 06-Jul-20:00 2016 GMT. This pattern is still in the process of forming. 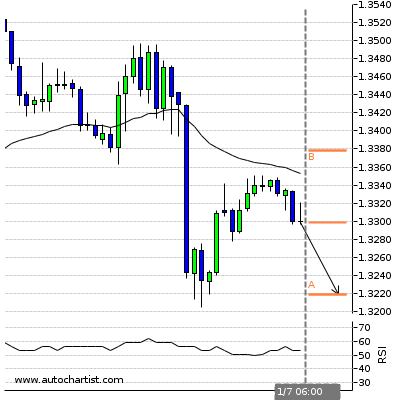 Possible bearish price movement towards the support 1,342.39 within the next 2 days. ( B ) 1375.26Last resistance turning point of Channel Up. Triangle identified at 07-Jul-04:00 2016 GMT. This pattern is still in the process of forming. 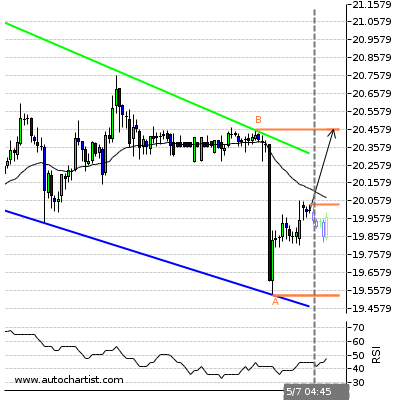 Possible bullish price movement towards the resistance 20.515 within the next 2 days. ( B ) 20.515Last resistance turning point of Triangle. ( A ) 19.865Last support turning point of Triangle. 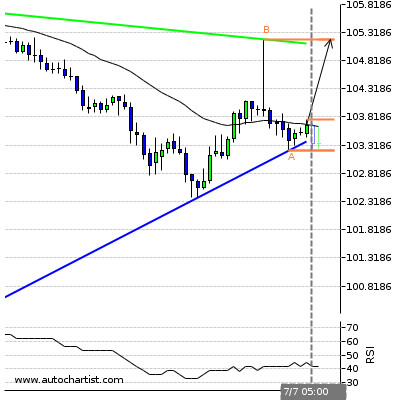 Possible bullish price movement towards the resistance 1.1109 within the next 4 hours. 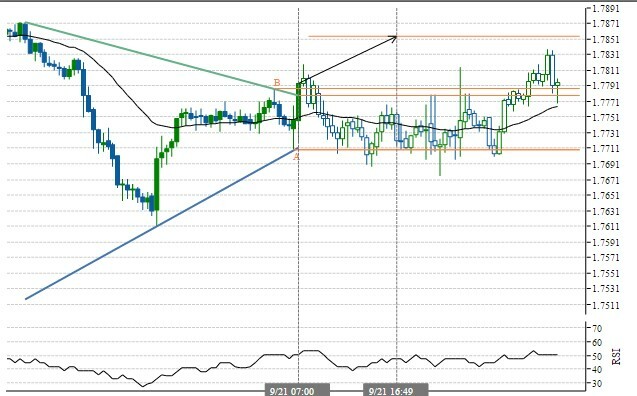 Possible bullish price movement towards the resistance 103.4248 within the next 4 hours. Rising Wedge identified at 12-Jul-04:15 2016 GMT. This pattern is still in the process of forming. 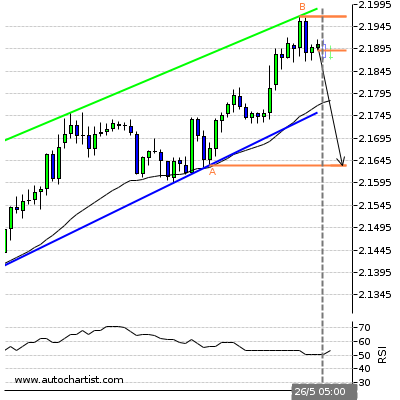 Possible bearish price movement towards the support 1.298 within the next 6 hours. ( B ) 1.3091Last resistance turning point of Rising Wedge. ( A ) 1.2977Last support turning point of Rising Wedge. Possible bullish price movement towards the resistance 0.986 within the next 4 hours. Channel Up identified at 12-Jul-05:00 2016 GMT. This pattern is still in the process of forming. 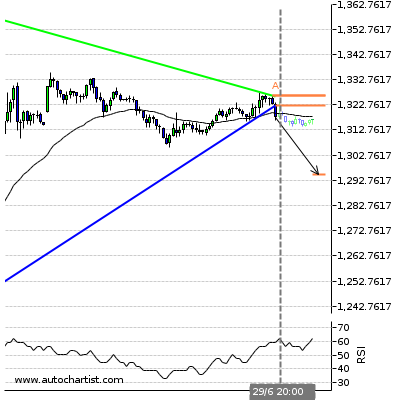 Possible bearish price movement towards the support 132.96 within the next 15 hours. ( B ) 134.906Last resistance turning point of Channel Up. 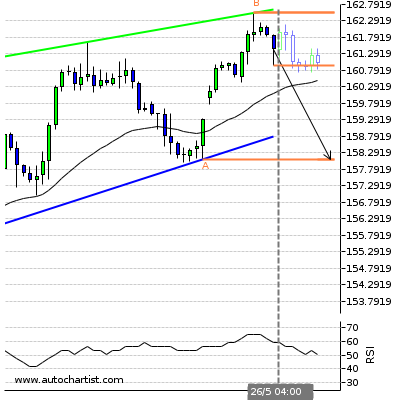 ( A ) 132.96Last support turning point of Channel Up. Rising Wedge identified at 12-Jul-04:30 2016 GMT. This pattern is still in the process of forming. 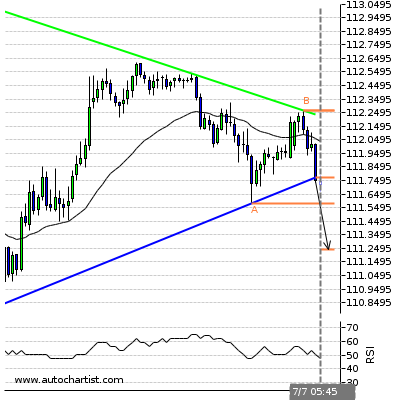 Possible bearish price movement towards the support 113.29 within the next 7 hours. ( B ) 114.32Last resistance turning point of Rising Wedge. 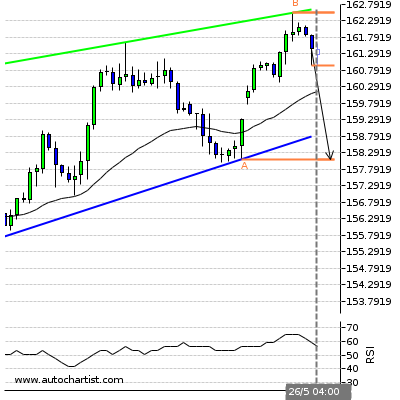 ( A ) 113.29Last support turning point of Rising Wedge. Triangle identified at 12-Jul-05:15 2016 GMT. This pattern is still in the process of forming. 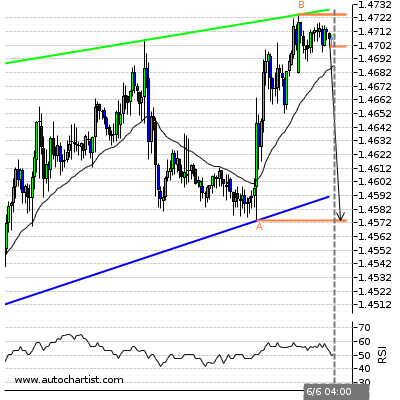 Possible bearish price movement towards the support 1.45 within the next 5 hours. 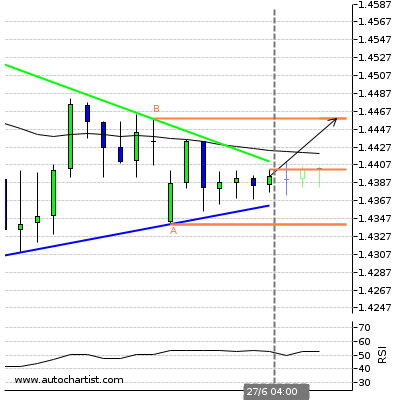 ( B ) 1.4526Last resistance turning point of Triangle. 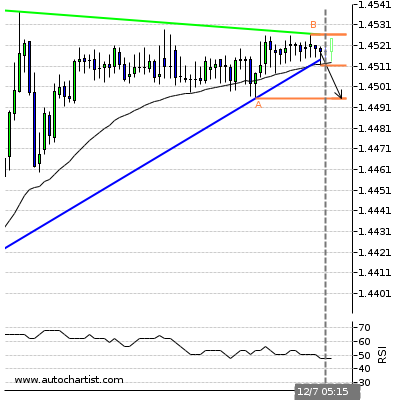 ( A ) 1.4495Last support turning point of Triangle. Rising Wedge identified at 12-Jul-04:00 2016 GMT. This pattern is still in the process of forming. 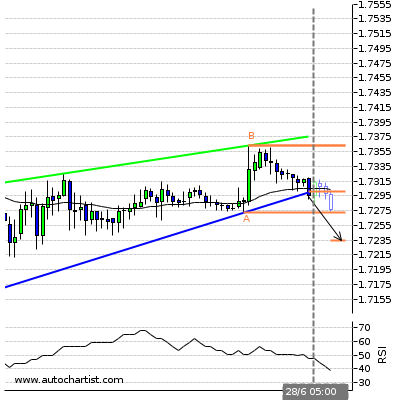 Possible bearish price movement towards the support 1.793 within the next 5 hours. ( B ) 1.8042Last resistance turning point of Rising Wedge. ( A ) 1.7934Last support turning point of Rising Wedge. Falling Wedge has broken through the resistance line at 11-Jul-08:00 2016 GMT. 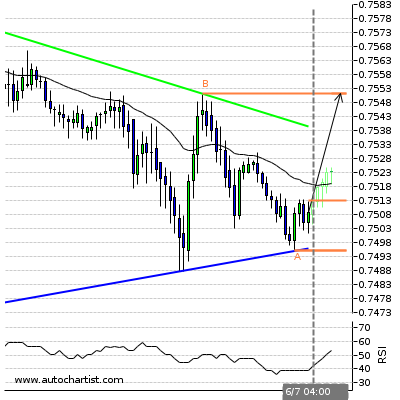 Possible bullish price movement forecast for the next 2 days towards 78.85. 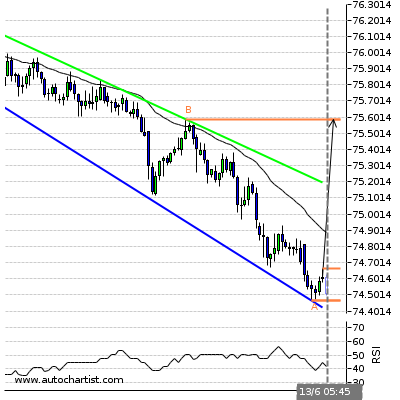 ( A ) 76.7645Last support turning point of Falling Wedge. Rising Wedge identified at 12-Jul-04:15 2016 GMT. This pattern is still in the process of forming. 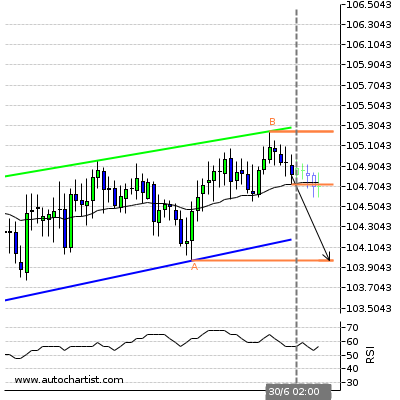 Possible bearish price movement towards the support 104.001 within the next 7 hours. ( B ) 104.96Last resistance turning point of Rising Wedge. ( A ) 104.001Last support turning point of Rising Wedge. Rectangle identified at 11-Jul-08:00 2016 GMT. This pattern is still in the process of forming. 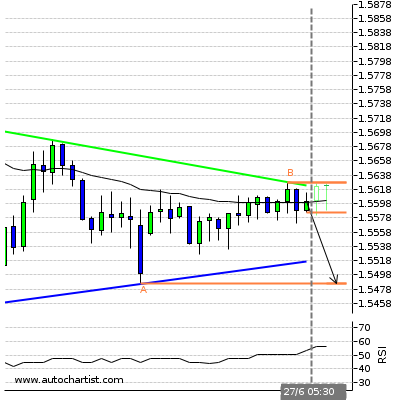 Possible bearish price movement towards the support 1,335.615 within the next 2 days. ( B ) 1375.13Last resistance turning point of Rectangle. 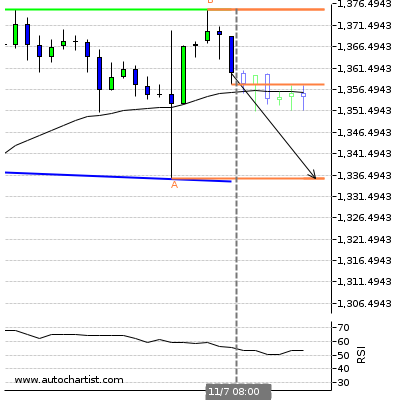 ( A ) 1335.615Last support turning point of Rectangle. Triangle has broken through the resistance line at 12-Jul-02:00 2016 GMT. 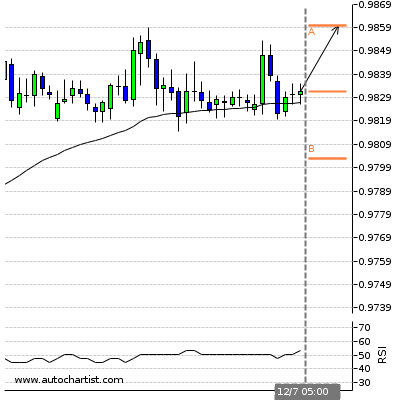 Possible bullish price movement forecast for the next 7 hours towards 20.566. ( B ) 20.35Last resistance turning point of Triangle. ( A ) 20.16Last support turning point of Triangle. 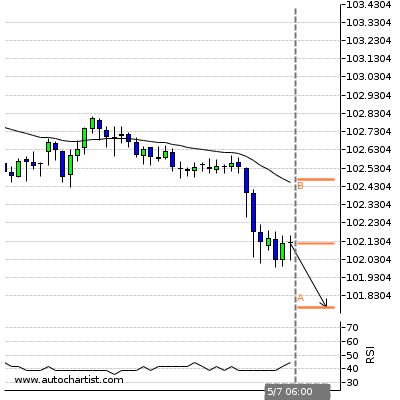 Possible bearish price movement towards the support 1.0992 within the next 4 hours. Rising Wedge identified at 20-Jul-04:00 2016 GMT. This pattern is still in the process of forming. 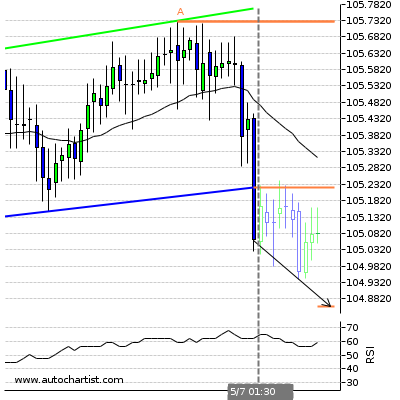 Possible bearish price movement towards the support 104.633 within the next 2 days. ( B ) 106.5355Last resistance turning point of Rising Wedge. ( A ) 104.633Last support turning point of Rising Wedge. 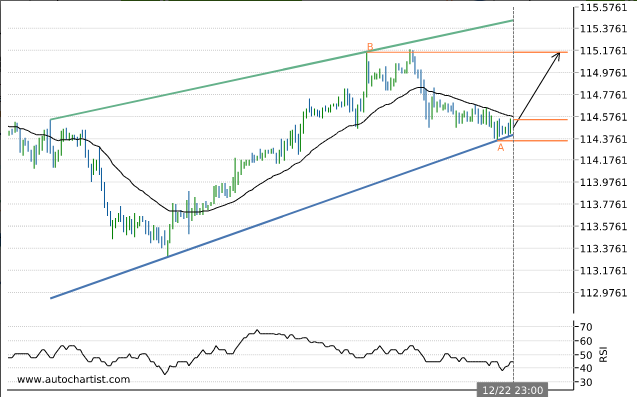 Triangle has broken through the support line at 19-Jul-12:00 2016 GMT. 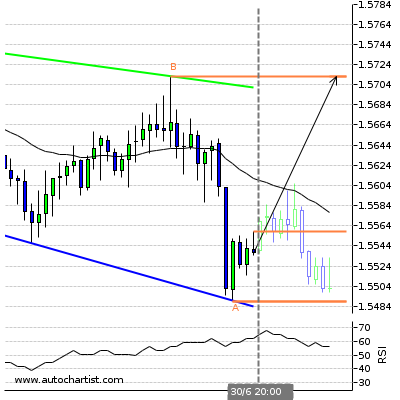 Possible bearish price movement forecast for the next 2 days towards 1.304. 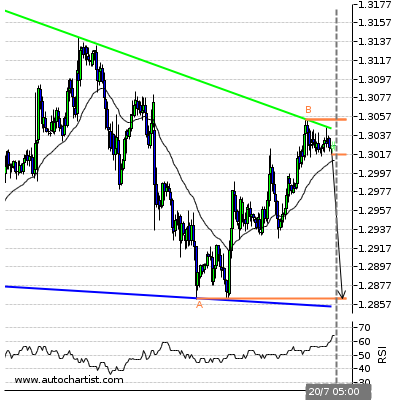 ( A ) 1.3272Last resistance turning point of Triangle. Falling Wedge identified at 20-Jul-00:00 2016 GMT. This pattern is still in the process of forming. 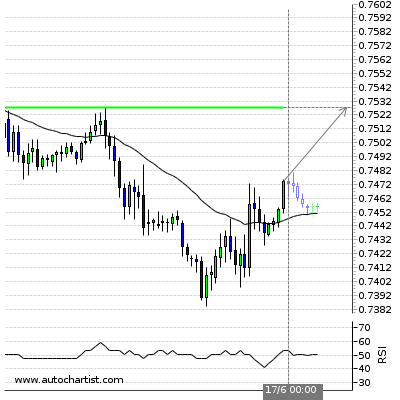 Possible bullish price movement towards the resistance 0.76 within the next 2 days. 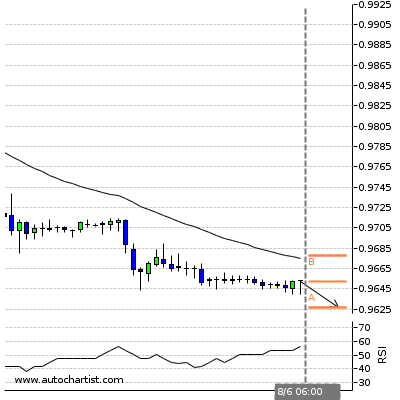 ( B ) 0.7603Last resistance turning point of Falling Wedge. 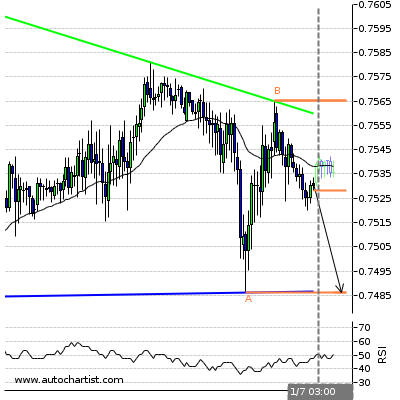 ( A ) 0.7475Last support turning point of Falling Wedge. Channel Up identified at 20-Jul-05:00 2016 GMT. This pattern is still in the process of forming. 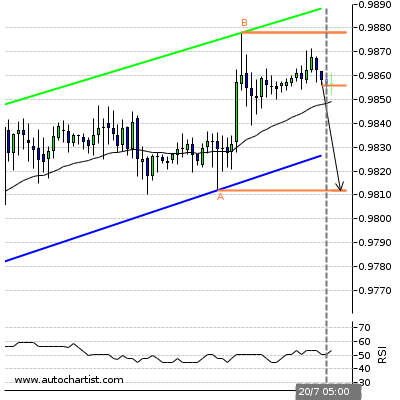 Possible bearish price movement towards the support 0.981 within the next 22 hours. 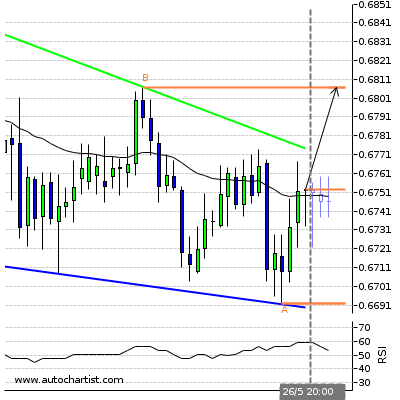 ( B ) 0.9878Last resistance turning point of Channel Up. 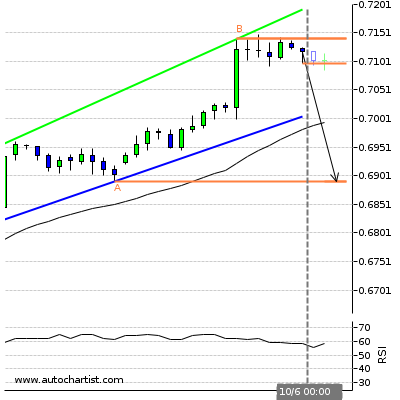 ( A ) 0.9812Last support turning point of Channel Up. Descending Triangle identified at 20-Jul-05:00 2016 GMT. This pattern is still in the process of forming. 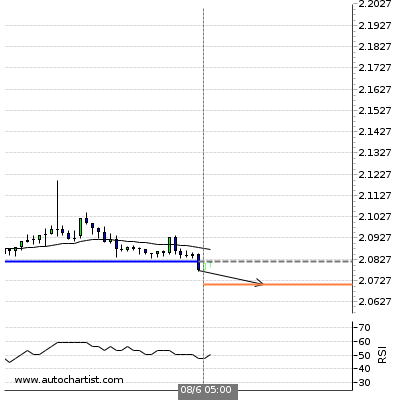 Possible bearish price movement towards the support 1.286 within the next 3 days. 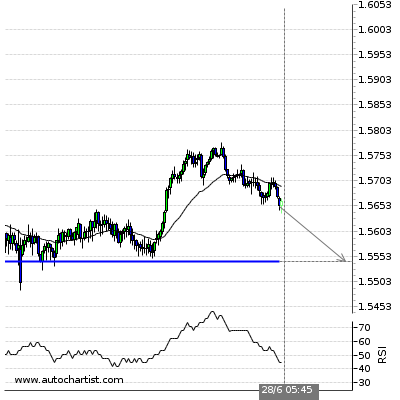 ( B ) 1.3054Last resistance turning point of Descending Triangle. 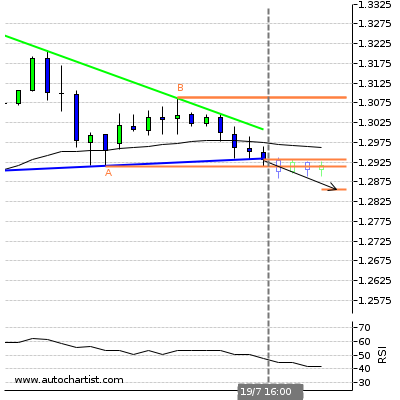 ( A ) 1.2863Last support turning point of Descending Triangle. Triangle has broken through the support line at 19-Jul-20:00 2016 GMT. 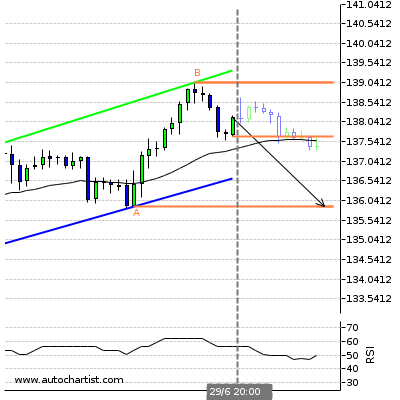 Possible bearish price movement forecast for the next 2 days towards 137.23. ( B ) 140.936Last resistance turning point of Triangle. ( A ) 137.8325Last support turning point of Triangle. Triangle has broken through the support line at 19-Jul-16:00 2016 GMT. 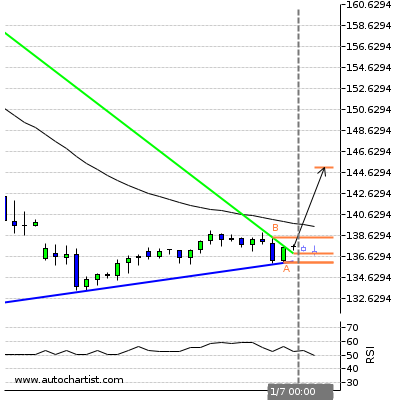 Possible bearish price movement forecast for the next 3 days towards 115.013. ( B ) 117.77Last resistance turning point of Triangle. 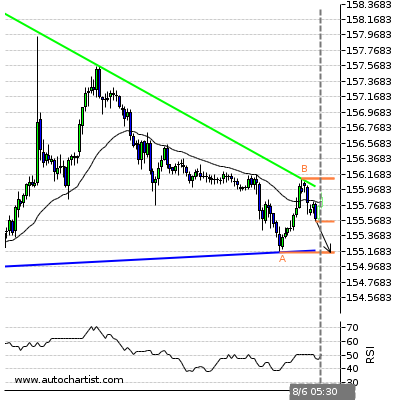 ( A ) 115.47Last support turning point of Triangle. Triangle has broken through the support line at 19-Jul-16:00 2016 GMT. 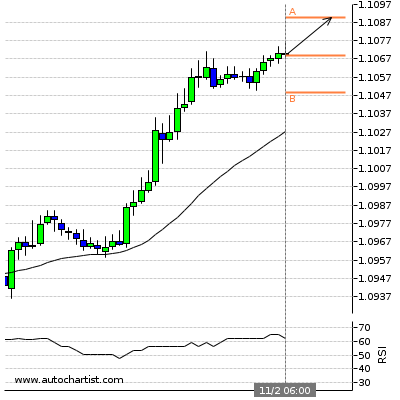 Possible bearish price movement forecast for the next 2 days towards 1.081. 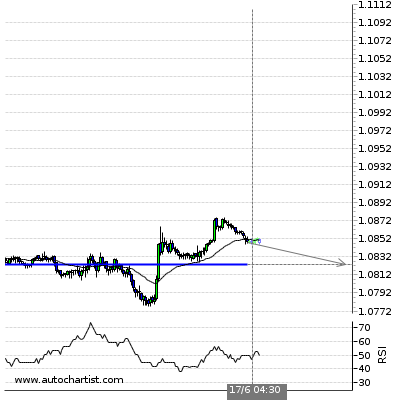 ( B ) 1.0891Last resistance turning point of Triangle. 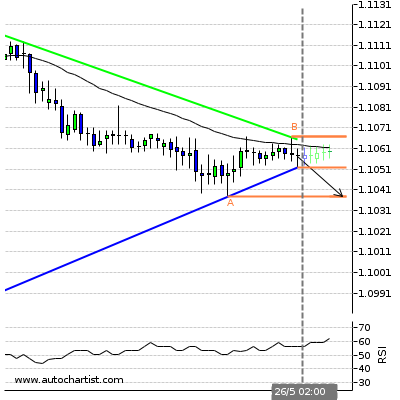 ( A ) 1.0838Last support turning point of Triangle. Triangle has broken through the support line at 19-Jul-16:00 2016 GMT. 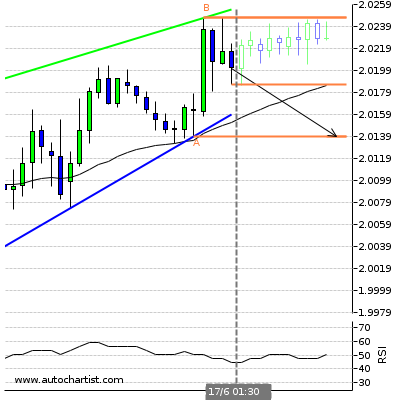 Possible bearish price movement forecast for the next 2 days towards 1.286. 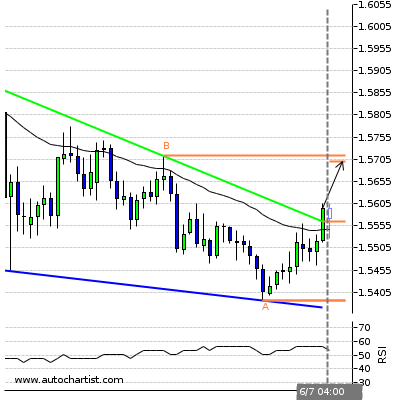 ( B ) 1.3088Last resistance turning point of Triangle. Descending Triangle identified at 19-Jul-16:00 2016 GMT. This pattern is still in the process of forming. 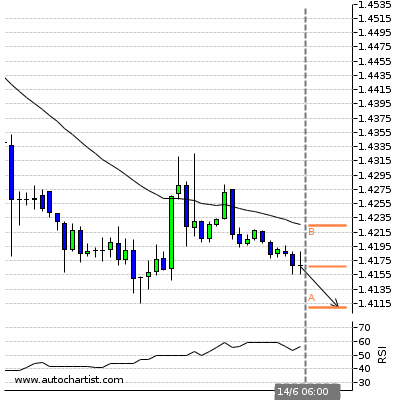 Possible bearish price movement towards the support 1.428 within the next 3 days. 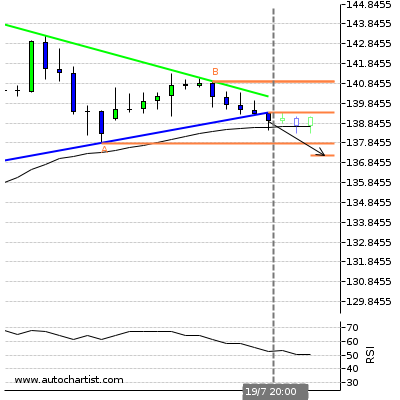 ( B ) 1.4412Last resistance turning point of Descending Triangle. 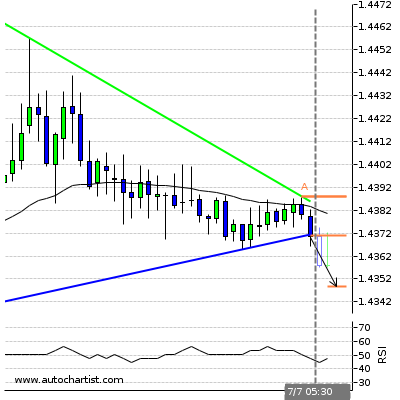 ( A ) 1.4277Last support turning point of Descending Triangle. Triangle has broken through the support line at 19-Jul-20:00 2016 GMT. 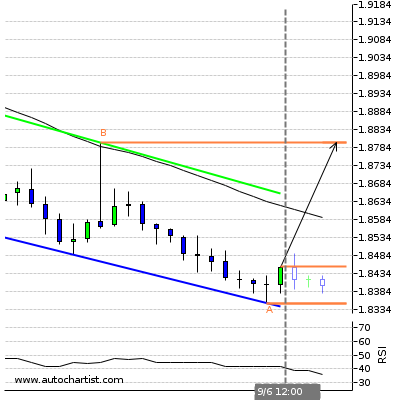 Possible bearish price movement forecast for the next 2 days towards 1.693. ( B ) 1.7294Last resistance turning point of Triangle. 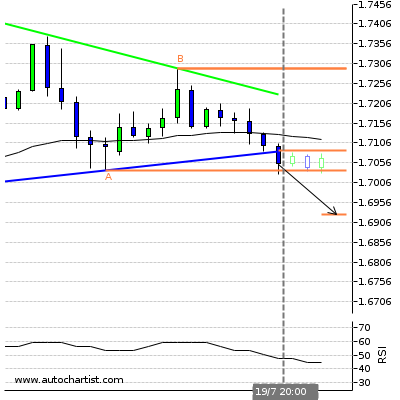 ( A ) 1.7037Last support turning point of Triangle. Falling Wedge identified at 20-Jul-05:00 2016 GMT. This pattern is still in the process of forming. Possible bullish price movement towards the resistance 1.865 within the next 7 hours. 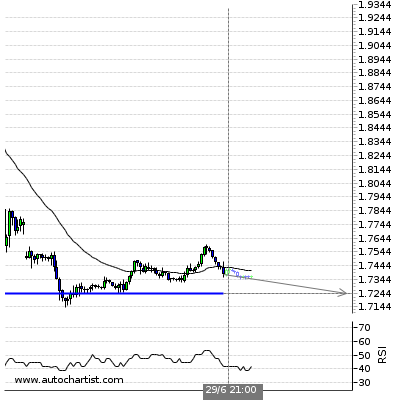 ( B ) 1.8646Last resistance turning point of Falling Wedge. 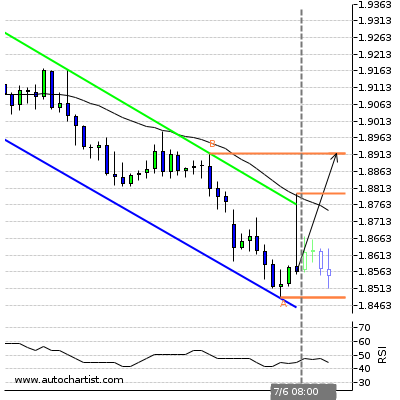 ( A ) 1.8535Last support turning point of Falling Wedge. 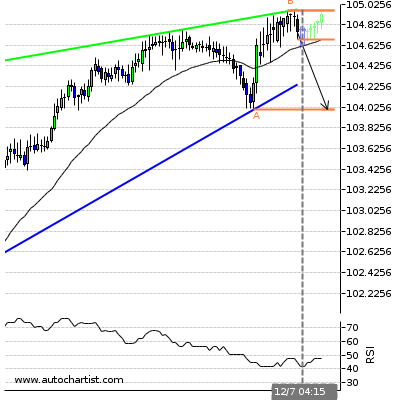 Channel Up has broken through the support line at 20-Jul-01:00 2016 GMT. Possible bearish price movement forecast for the next 17 hours towards 80.99. ( B ) 82.158Last resistance turning point of Channel Up. ( A ) 80.923Last support turning point of Channel Up. Triangle has broken through the support line at 18-Jul-16:00 2016 GMT. 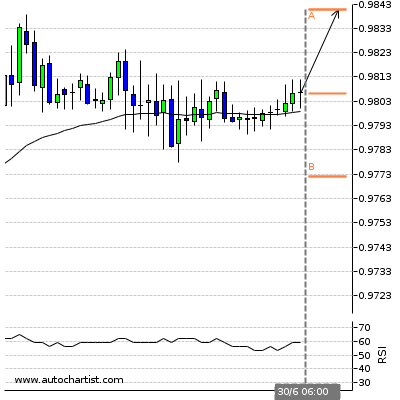 Possible bearish price movement forecast for the next 2 days towards 0.753. 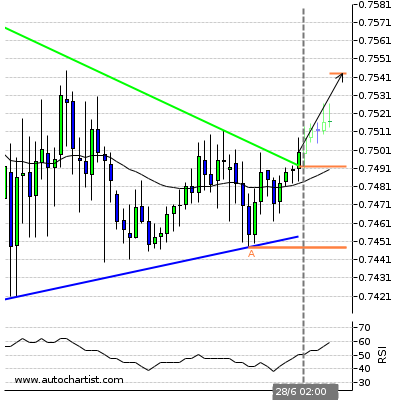 ( B ) 0.7612Last resistance turning point of Triangle. ( A ) 0.7555Last support turning point of Triangle. Triangle has broken through the support line at 20-Jul-01:00 2016 GMT. 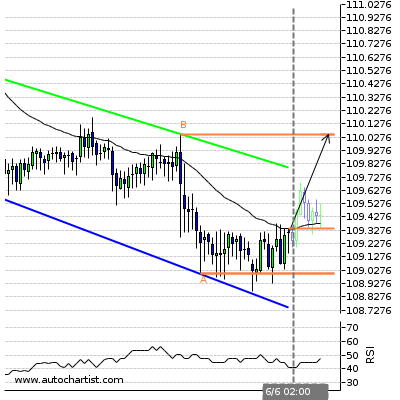 Possible bearish price movement forecast for the next 2 days towards 106.917. ( B ) 108.17Last resistance turning point of Triangle. ( A ) 106.4535Last support turning point of Triangle. Triangle identified at 20-Jul-05:00 2016 GMT. This pattern is still in the process of forming. 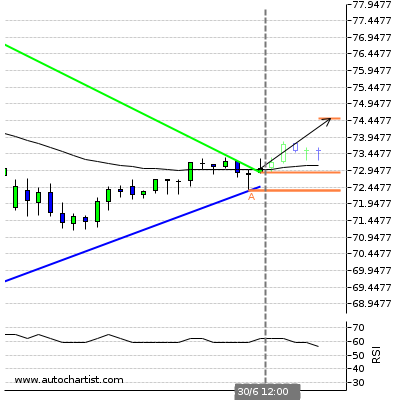 Possible bullish price movement towards the resistance 75.012 within the next 10 hours. ( B ) 75.0115Last resistance turning point of Triangle. ( A ) 74.3235Last support turning point of Triangle. 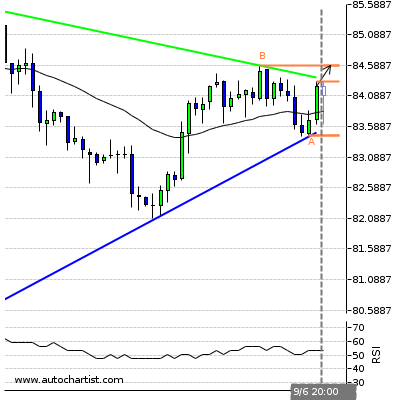 GBP/CAD recently broke the high Quality Pennant chart pattern – that was previously identified by Autochartist on the daily charts. The overall Quality of this Pennant is measured by Autochartist at the 9-bar level – which reflects the sharp Initial Trend (10 bars), significant Uniformity and Clarity (both rated at the 8-bar level). 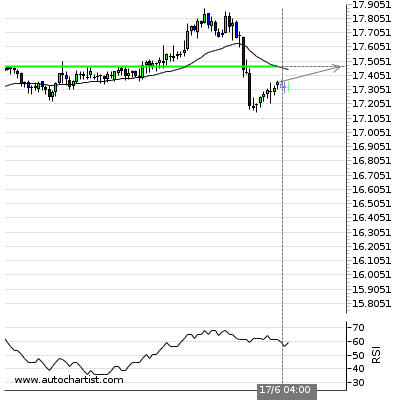 The strength of this Pennant breakout is rated by Autochartist at the 10-bar level. 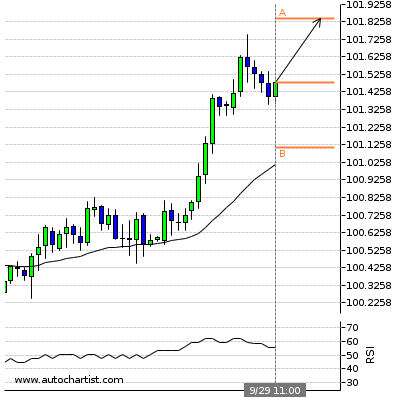 USD/CAD is expected to fall to the Forecast Price 1.6791. 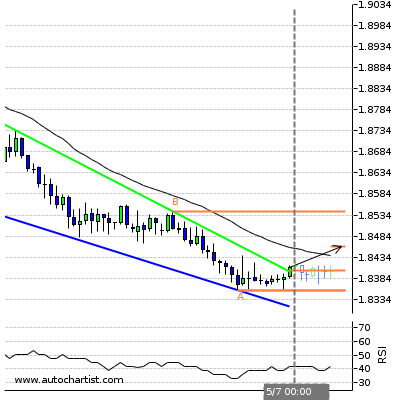 The breakout of this Pennant is a “Continuation” chart pattern – meaning it is aligned with the prevailing downtrend that can be seen on the daily GBP/CAD charts. The top of this Pennant formed when the pair reversed down from the resistance zone lying between the pivotal resistance level 1.7500 (top of earlier correction from August), upper daily Bollinger band and the 38.2% Fibonacci correction of the downward impulse from June. 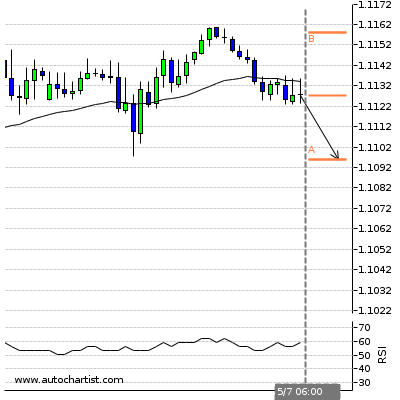 Possible bearish price movement towards the support 1.1111 within the next 4 hours. 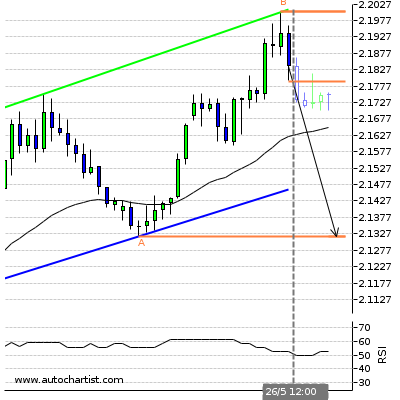 Possible bearish price movement towards the support 1.2921 within the next 4 hours. Channel Up identified at 20-Sep-10:00. This pattern is still in the process of forming. 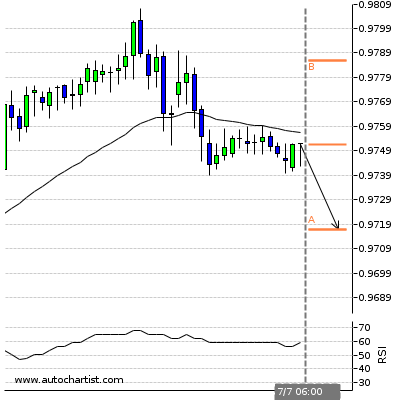 Possible bearish price movement towards the support 0.9692 within the next 3 days. Rectangle identified at 21-Sep-02:00. This pattern is still in the process of forming. 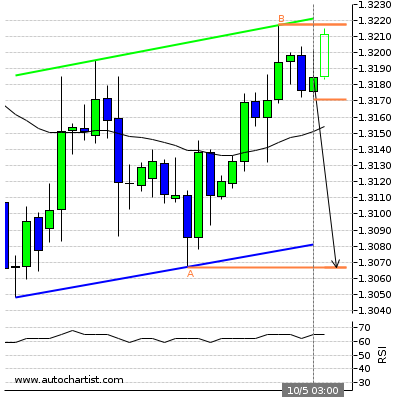 Possible bearish price movement towards the support 1.3135 within the next 2 days. Channel Up identified at 20-Sep-18:00. This pattern is still in the process of forming. 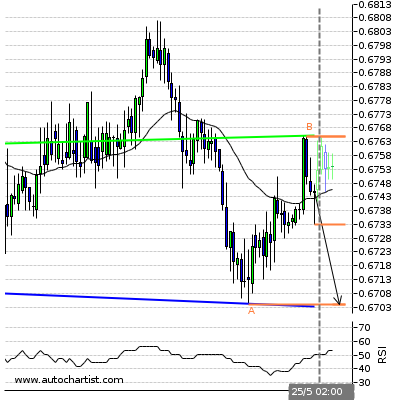 Possible bearish price movement towards the support 0.7255 within the next 2 days. Channel Down has broken through the resistance line at 21-Sep-07:30. 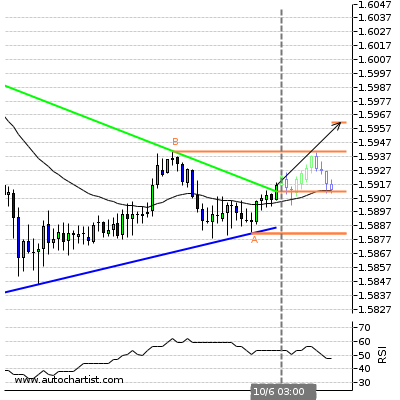 Possible bullish price movement forecast for the next 2 days towards 133.6466. Channel Down identified at 21-Sep-02:00. This pattern is still in the process of forming. 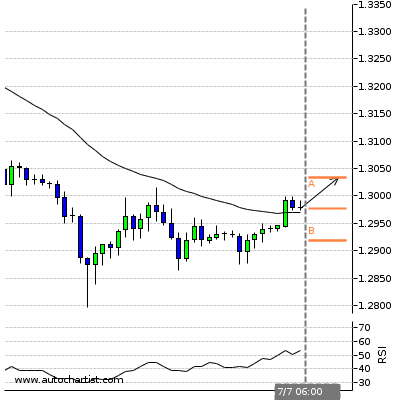 Possible bullish price movement towards the resistance 1.2833 within the next 2 days. Triangle identified at 20-Sep-22:00. This pattern is still in the process of forming. 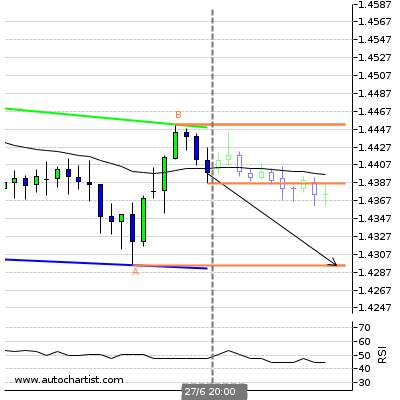 Possible bearish price movement towards the support 1.4651 within the next 2 days. Triangle has broken through the resistance line at 21-Sep-07:00. 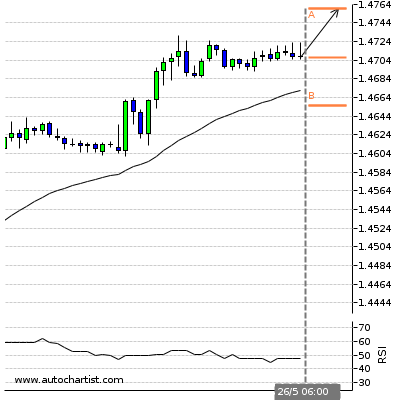 Possible bullish price movement forecast for the next 10 hours towards 1.5319. 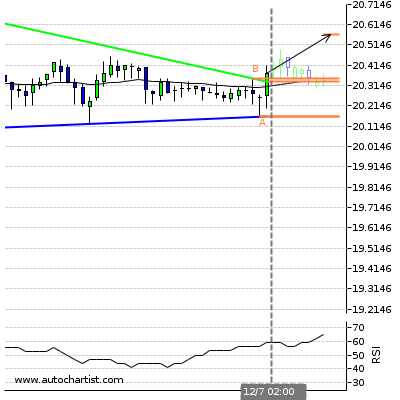 Triangle has broken through the resistance line at 21-Sep-07:00. 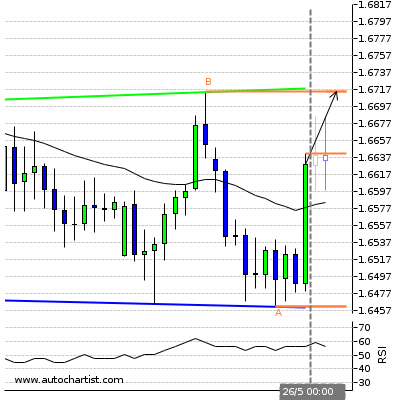 Possible bullish price movement forecast for the next 9 hours towards 1.7854. Pennant has broken through the support line at 27-Sep-04:00 2016 GMT. 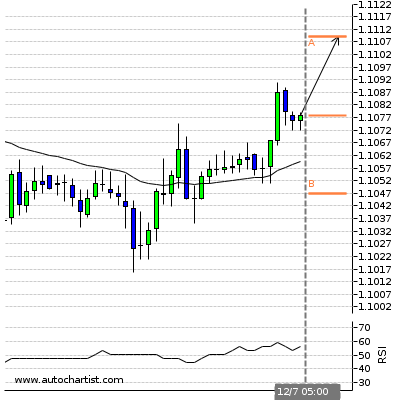 Possible bearish price movement forecast for the next 2 days towards 1.1206. ( B ) 1.1279Last resistance turning point of Pennant. 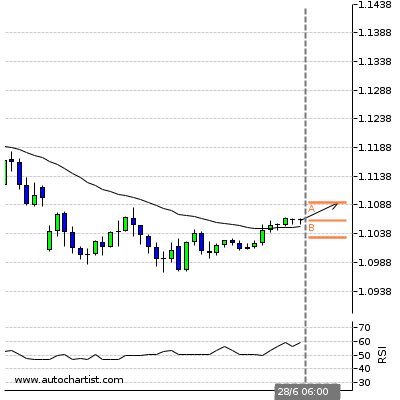 ( A ) 1.1221Last support turning point of Pennant. Falling Wedge identified at 27-Sep-04:00 2016 GMT. This pattern is still in the process of forming. 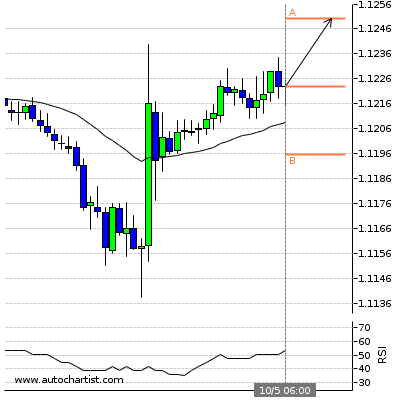 Possible bullish price movement towards the resistance 1.3121 within the next 3 days. 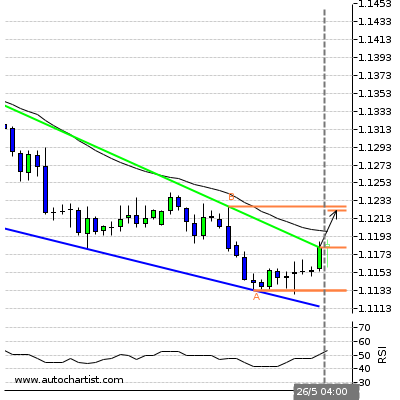 ( B ) 1.3121Last resistance turning point of Falling Wedge. 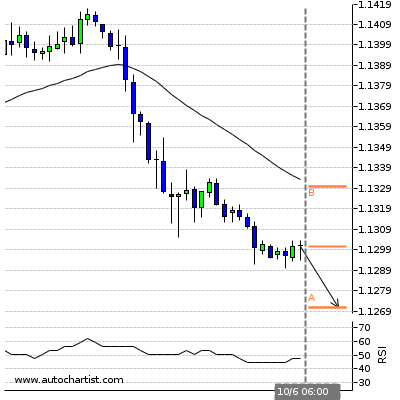 ( A ) 1.2914Last support turning point of Falling Wedge. 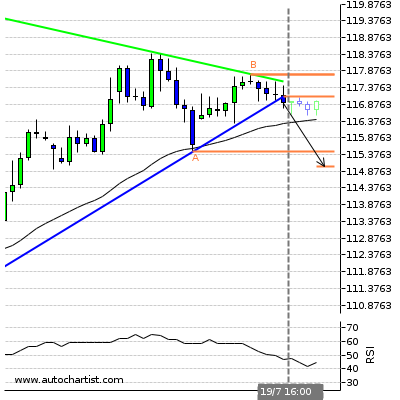 Possible bearish price movement towards the support 1.1179 within the next 4 hours. 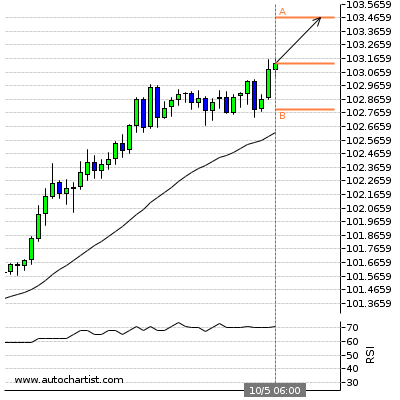 Possible bullish price movement towards the resistance 101.8462 within the next 4 hours. 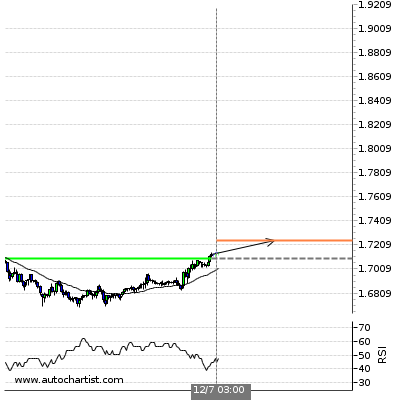 Possible bullish price movement towards the resistance 1.1250 within the next 4 hours. 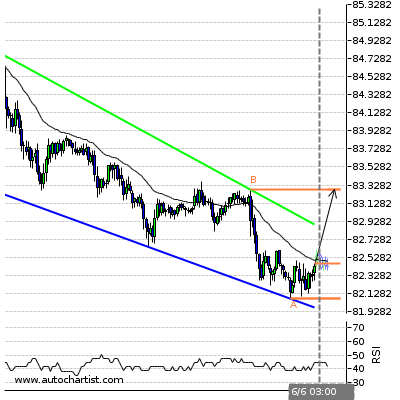 Possible bullish price movement towards the resistance 103.4630 within the next 4 hours. 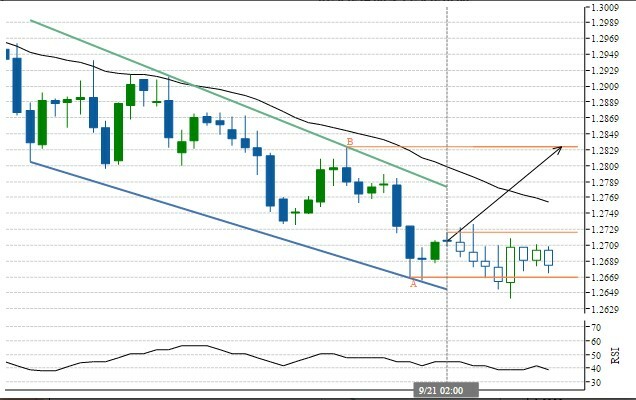 Falling Wedge has broken through the resistance line at 05-Oct-03:15 2016 GMT-5. 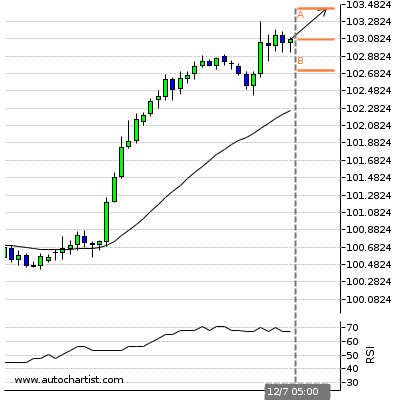 Possible bullish price movement forecast for the next 8 hours towards 1.2758. 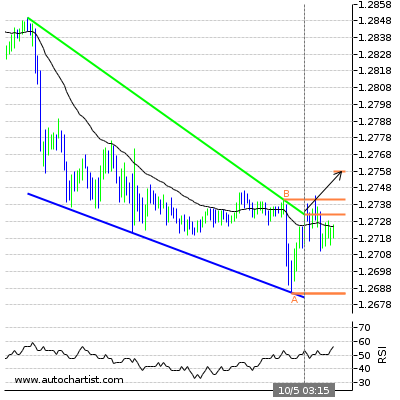 ( B ) 1.2741Last resistance turning point of Falling Wedge. 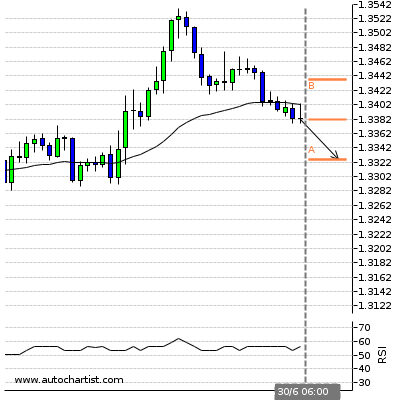 ( A ) 1.2686Last support turning point of Falling Wedge. 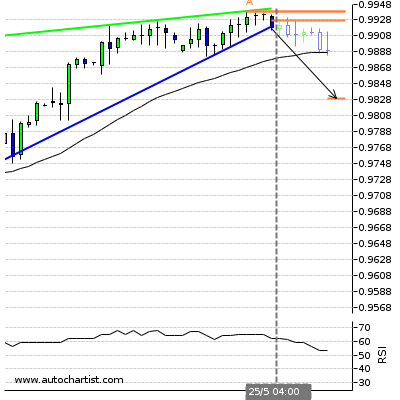 Possible bearish price movement towards the support 0.9744 within the next 4 hours. Flag identified at 05-Oct-03:00 2016 GMT-5. This pattern is still in the process of forming. 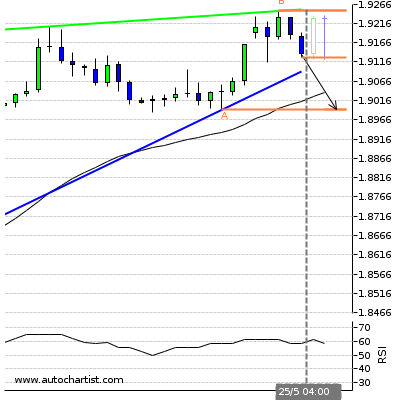 Possible bearish price movement towards the support 1.3067 within the next 2 days. ( B ) 1.3217Last resistance turning point of Flag. 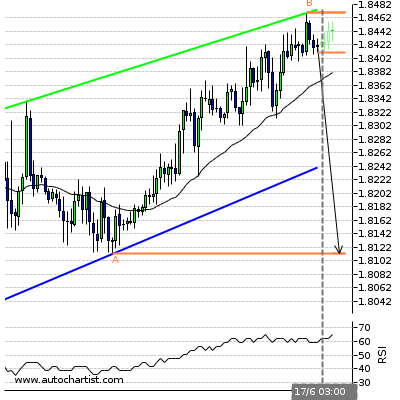 ( A ) 1.3067Last support turning point of Flag. Ascending Triangle identified at 03-Oct-19:00 2016 GMT-5. This pattern is still in the process of forming. 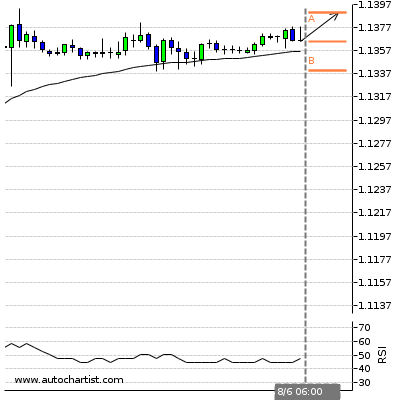 Possible bullish price movement towards the resistance 132.4415 within the next 3 days. ( B ) 132.4415Last resistance turning point of Ascending Triangle. ( A ) 130.069Last support turning point of Ascending Triangle. Falling Wedge identified at 05-Oct-03:30 2016 GMT-5. This pattern is still in the process of forming. 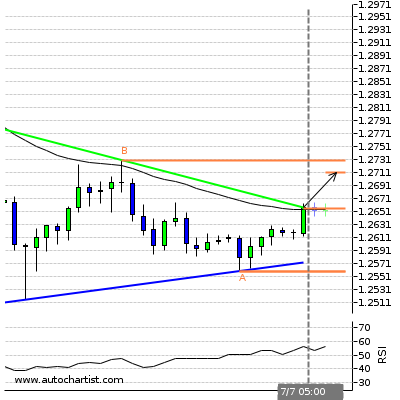 Possible bullish price movement towards the resistance 1.2467 within the next 6 hours. 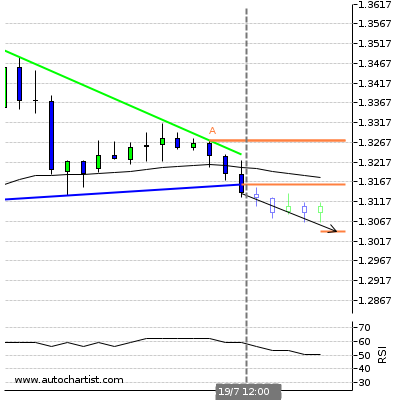 ( B ) 1.2467Last resistance turning point of Falling Wedge. 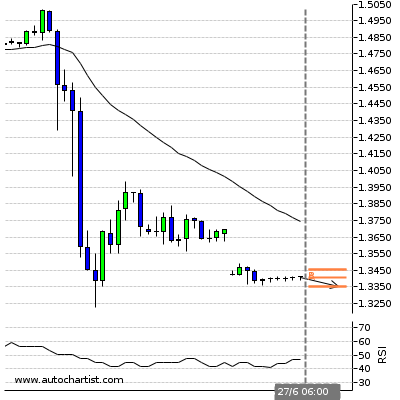 ( A ) 1.2405Last support turning point of Falling Wedge. Falling Wedge has broken through the resistance line at 05-Oct-03:30 2016 GMT-5. 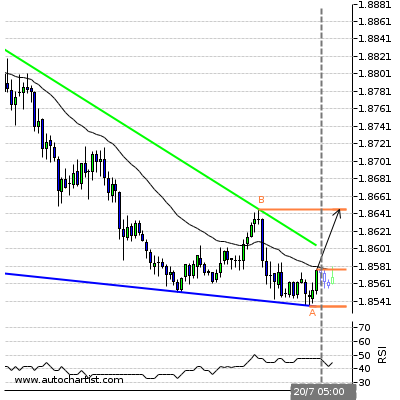 Possible bullish price movement forecast for the next 21 hours towards 1.6896. 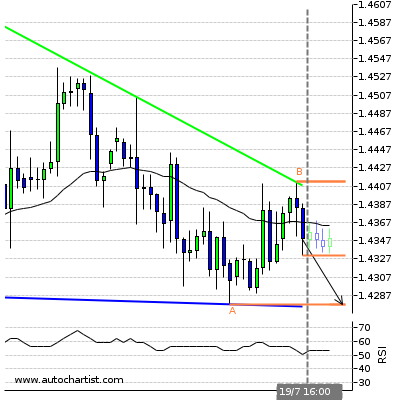 ( A ) 1.6734Last support turning point of Falling Wedge. Triangle identified at 05-Oct-05:00 2016 GMT-5. This pattern is still in the process of forming. 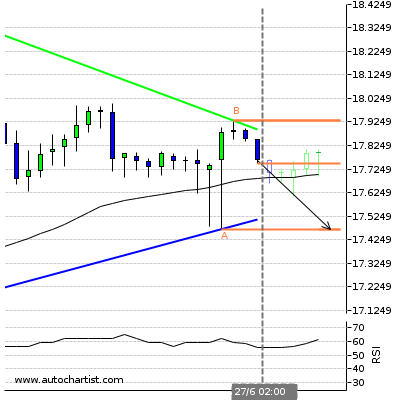 Possible bearish price movement towards the support 1.7686 within the next 7 hours. ( B ) 1.7745Last resistance turning point of Triangle. 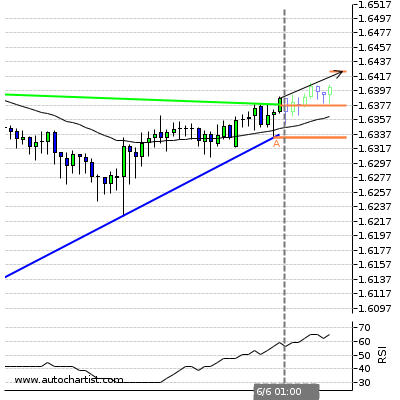 ( A ) 1.7686Last support turning point of Triangle. Channel Up identified at 04-Oct-15:00 2016 GMT-5. This pattern is still in the process of forming. 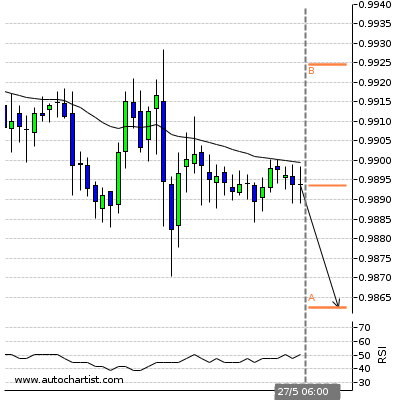 Possible bearish price movement towards the support 0.7329 within the next 2 days. 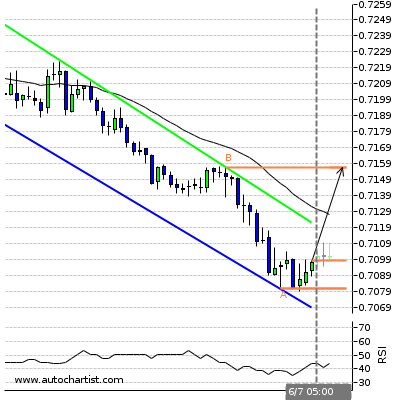 ( B ) 0.7472Last resistance turning point of Channel Up. 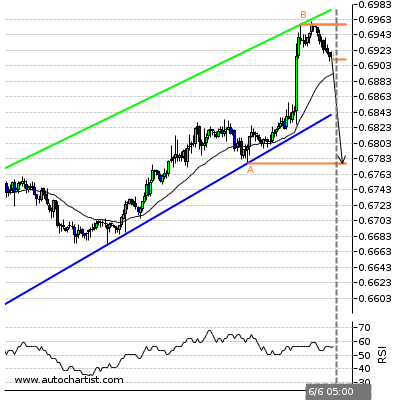 ( A ) 0.7329Last support turning point of Channel Up. Channel Up identified at 04-Oct-15:00 2016 GMT-5. This pattern is still in the process of forming. 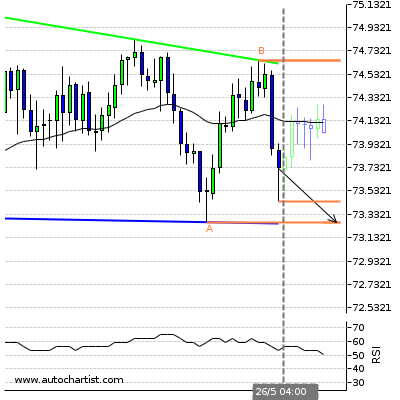 Possible bearish price movement towards the support 72.9765 within the next 2 days. 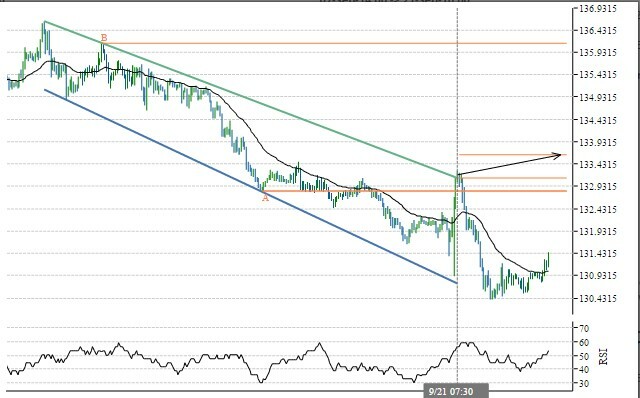 ( B ) 74.7135Last resistance turning point of Channel Up. 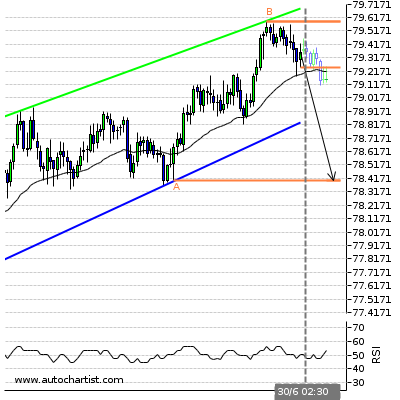 ( A ) 72.9765Last support turning point of Channel Up. 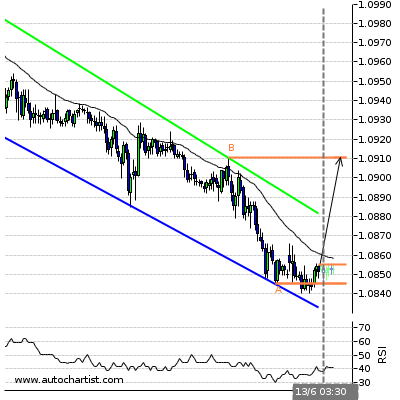 Possible bullish price movement towards the resistance 1.1089 within the next 4 hours. Ascending Triangle identified at 02-Nov-00:00 2016 GMT. This pattern is still in the process of forming. 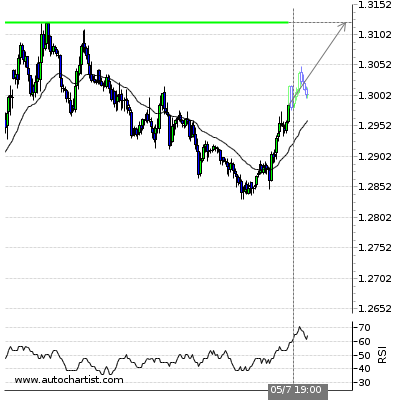 Possible bullish price movement towards the resistance 1.2281 within the next 2 days. ( B ) 1.2281Last resistance turning point of Ascending Triangle. 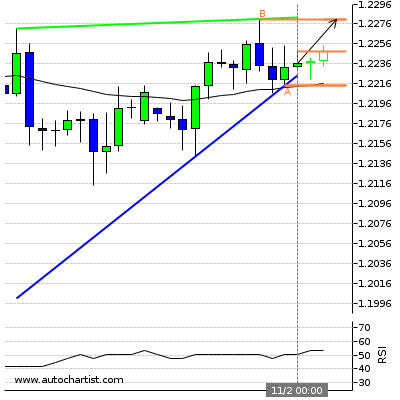 ( A ) 1.2214Last support turning point of Ascending Triangle. Possible bullish price movement towards the resistance 1.0490 within the next 4 hours. Falling Wedge identified at 26-Dec-05:30 2016 GMT. This pattern is still in the process of forming. 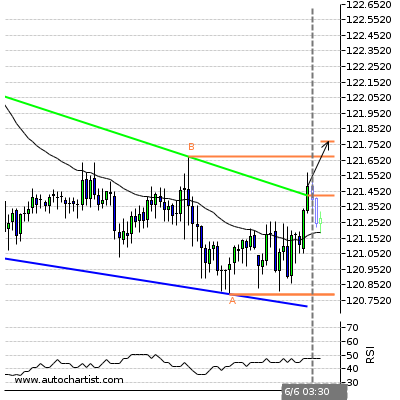 Possible bullish price movement towards the resistance 117.3690 within the next 12 hours. 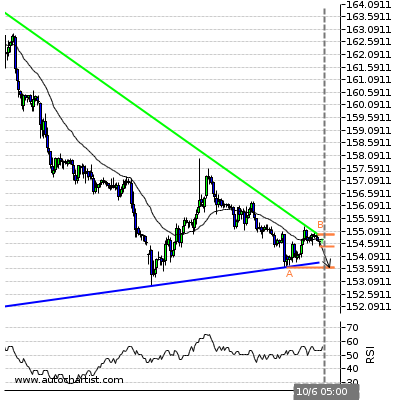 ( B ) 117.369Last resistance turning point of Falling Wedge. 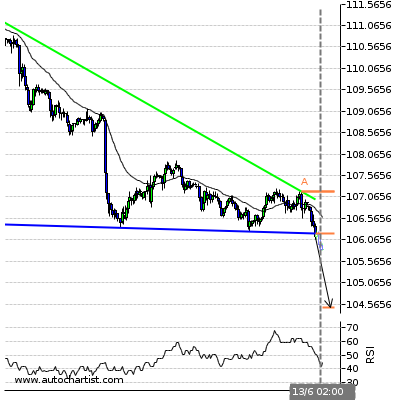 ( A ) 116.994Last support turning point of Falling Wedge. 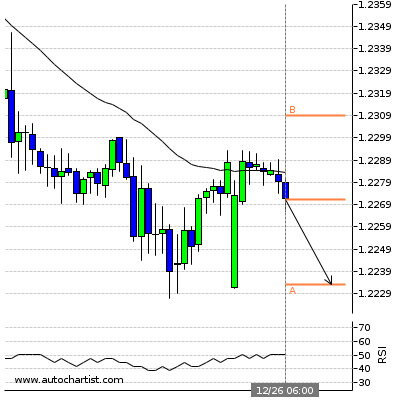 Possible bearish price movement towards the support 1.2233 within the next 4 hours. Falling Wedge has broken through the resistance line at 26-Dec-04:00 2016 GMT. 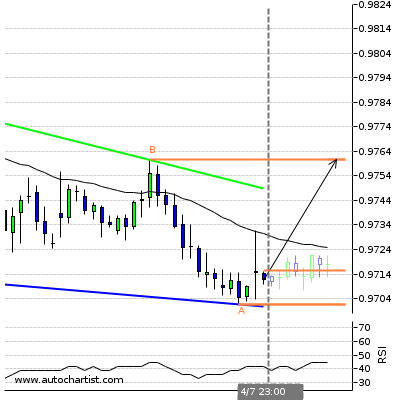 Possible bullish price movement forecast for the next 2 days towards 0.7210. 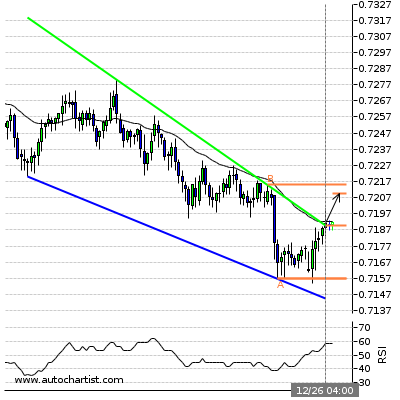 ( B ) 0.7215Last resistance turning point of Falling Wedge. ( A ) 0.7157Last support turning point of Falling Wedge. 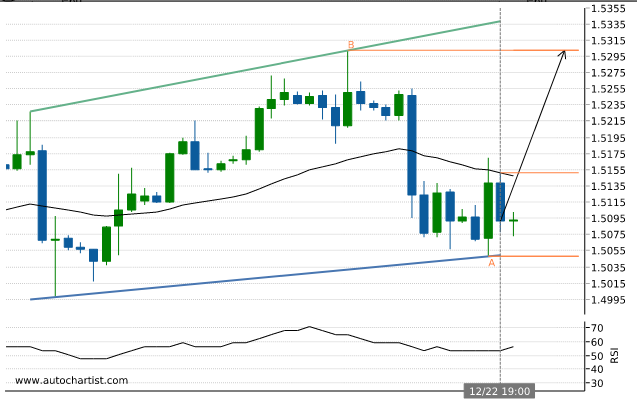 Trade Now Rising Wedge identified at 22-Dec-23:00. This pattern is still in the process of forming. 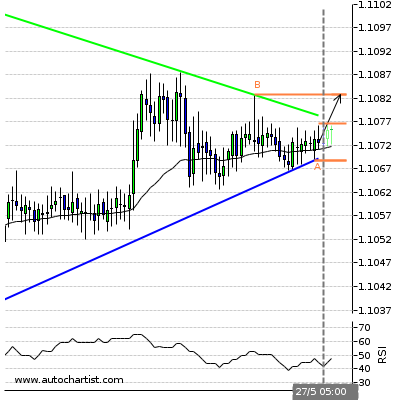 Possible bullish price movement towards the resistance 1.1902 within the next 2 days. Trade Now Descending Triangle identified at 22-Dec-03:00. This pattern is still in the process of forming. 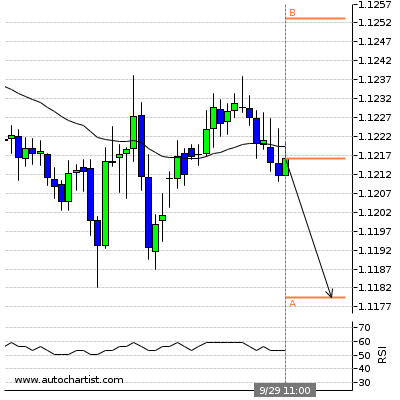 Possible bearish price movement towards the support 112.0325 within the next 3 days. 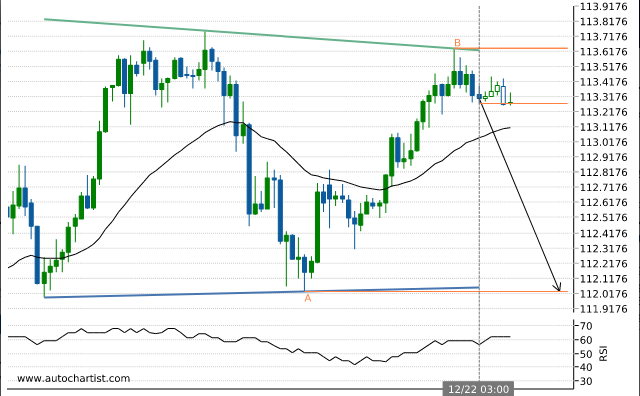 Trade Now Triangle identified at 21-Dec-23:00. This pattern is still in the process of forming. 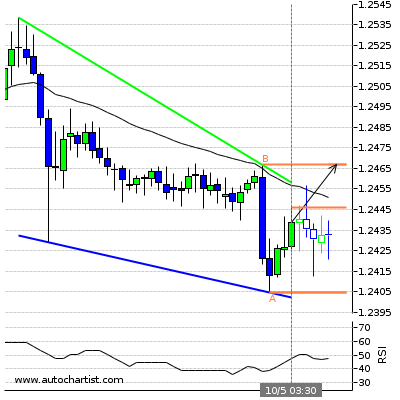 Possible bullish price movement towards the resistance 1.3420 within the next 16 hours. Trade Now Channel Down identified at 22-Dec-23:00. This pattern is still in the process of forming. 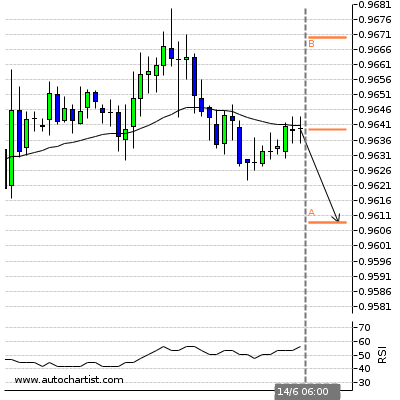 Possible bearish price movement towards the support 0.9829 within the next 3 days. Trade Now Channel Down identified at 22-Dec-23:00. This pattern is still in the process of forming. 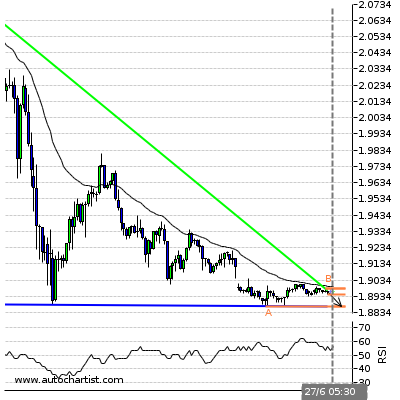 Possible bearish price movement towards the support 1.2700 within the next 2 days. 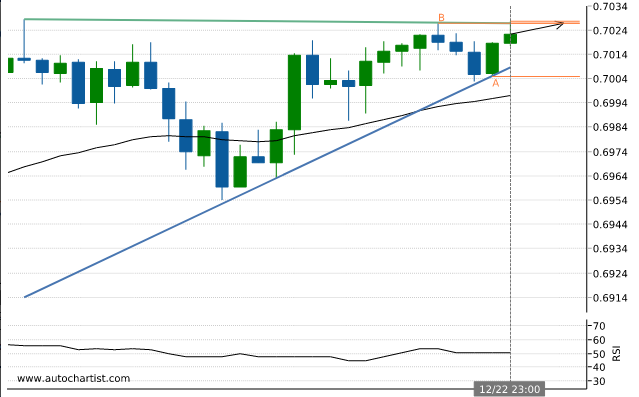 Trade Now Ascending Triangle identified at 22-Dec-23:00. This pattern is still in the process of forming. 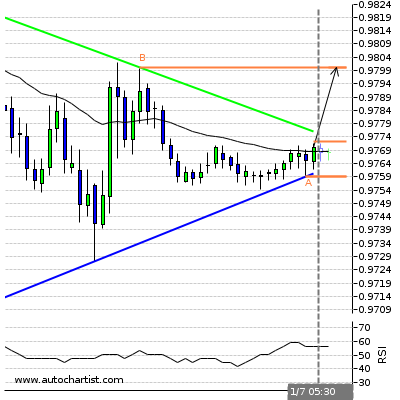 Possible bullish price movement towards the resistance 0.7027 within the next 2 days. 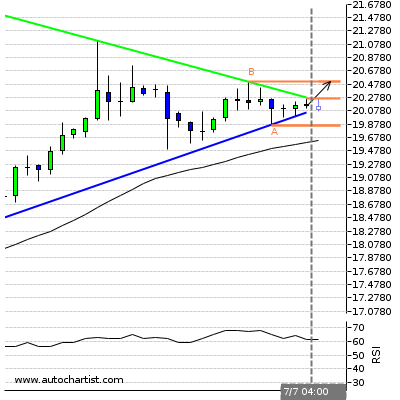 Trade Now Falling Wedge identified at 21-Dec-19:00. This pattern is still in the process of forming. 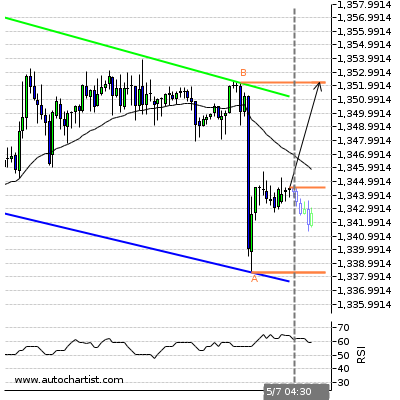 Possible bearish price movement towards the support 149.4155 within the next 3 days. 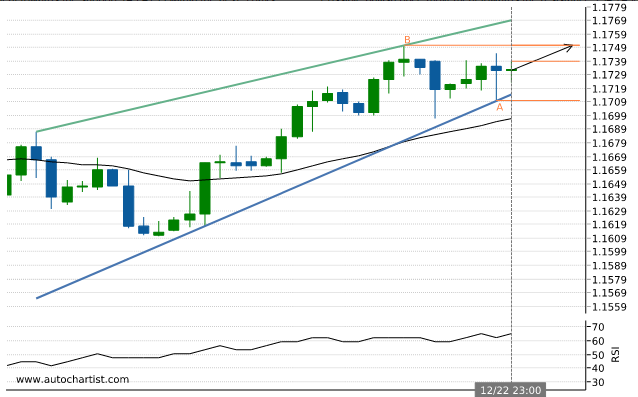 Trade Now Rising Wedge identified at 22-Dec-23:00. This pattern is still in the process of forming. 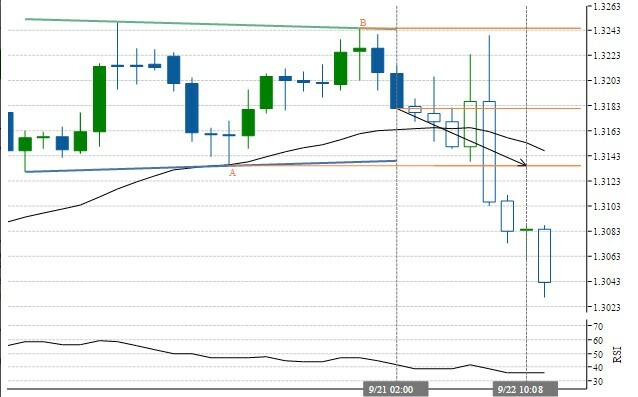 Possible bullish price movement towards the resistance 134.7490 within the next 2 days. 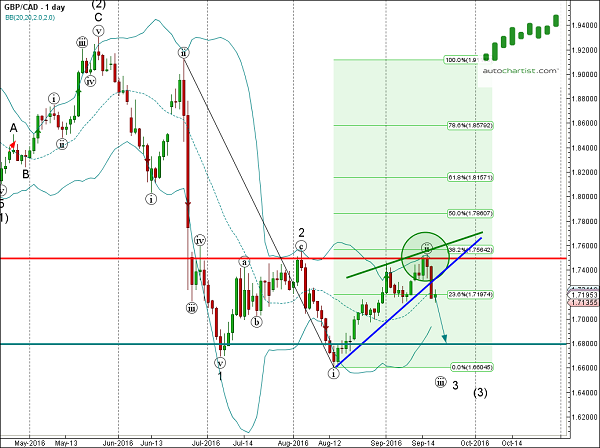 Trade Now Rising Wedge identified at 22-Dec-23:00. This pattern is still in the process of forming. 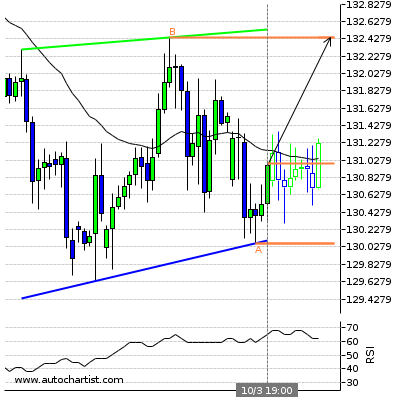 Possible bullish price movement towards the resistance 1.1751 within the next 2 days. Trade Now Falling Wedge identified at 22-Dec-23:00. This pattern is still in the process of forming. 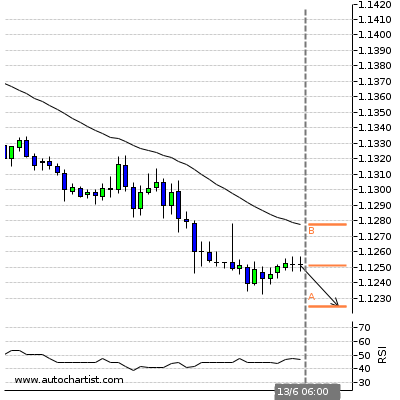 Possible bearish price movement towards the support 1.3149 within the next 3 days. 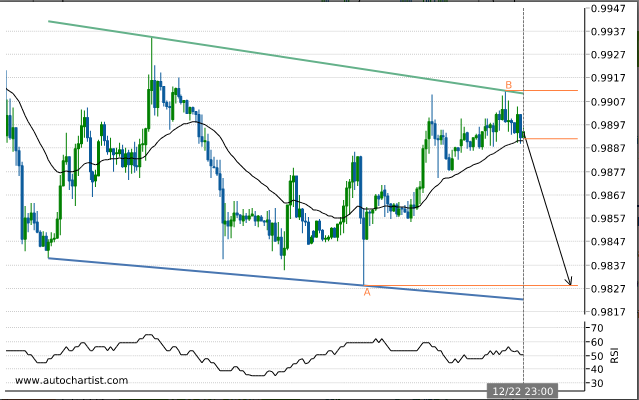 Trade Now Channel Up identified at 22-Dec-19:00. This pattern is still in the process of forming. 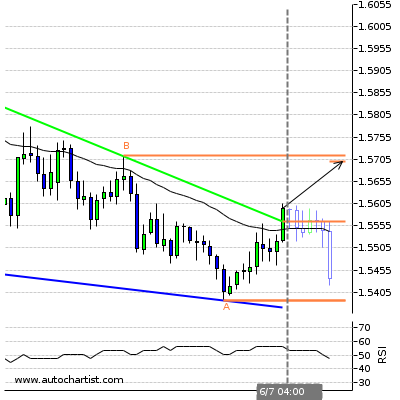 Possible bullish price movement towards the resistance 1.5302 within the next 2 days. Trade Now Channel Down identified at 22-Dec-15:00. This pattern is still in the process of forming. 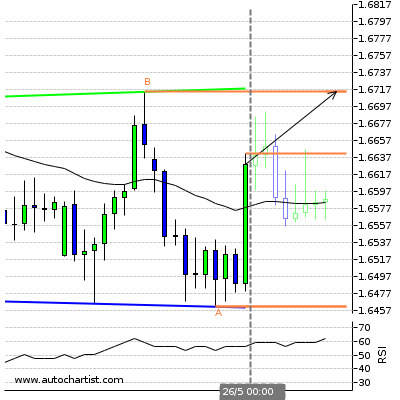 Possible bullish price movement towards the resistance 1.7257 within the next 2 days. 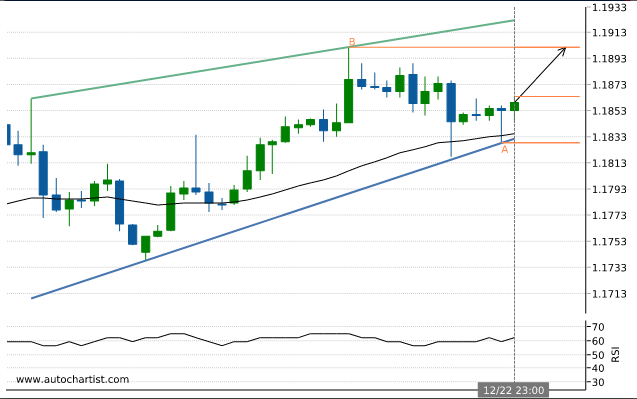 Trade Now Rising Wedge identified at 22-Dec-23:00. This pattern is still in the process of forming. 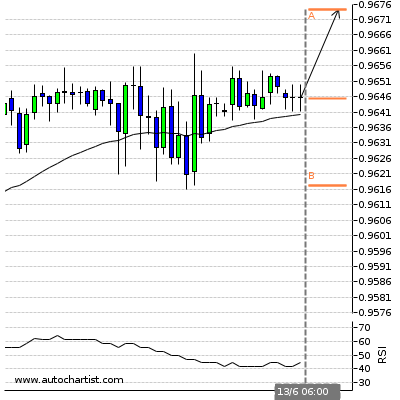 Possible bullish price movement towards the resistance 89.3355 within the next 3 days. 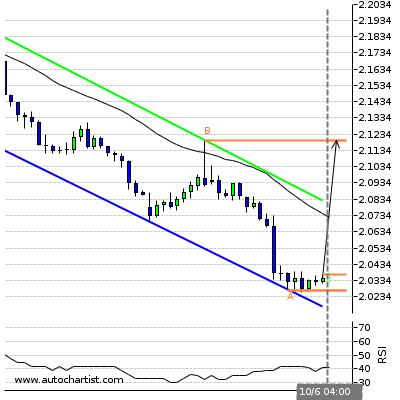 Trade Now Falling Wedge identified at 22-Dec-22:00. This pattern is still in the process of forming. 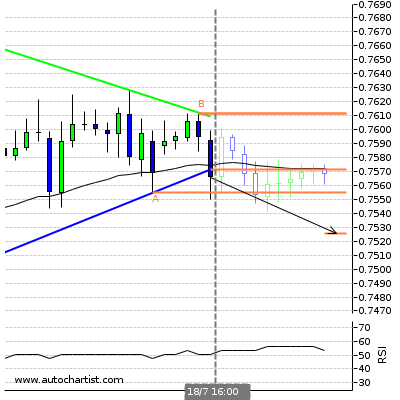 Possible bearish price movement towards the support 0.7735 within the next 6 hours. 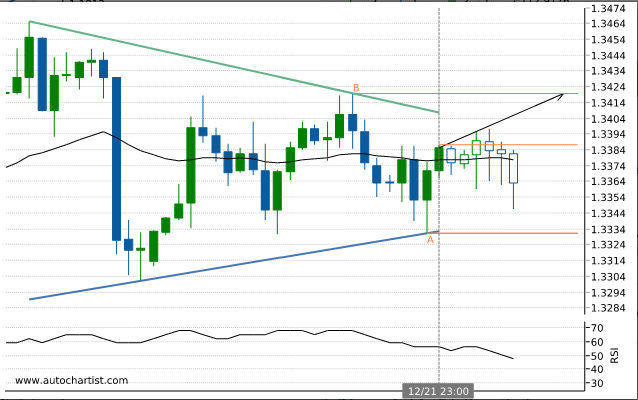 Trade Now Rising Wedge identified at 22-Dec-23:00. This pattern is still in the process of forming. 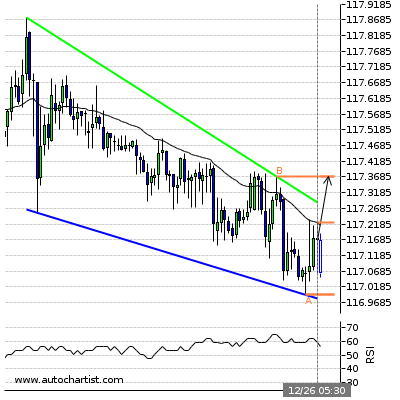 Possible bullish price movement towards the resistance 115.1615 within the next 3 days. Trade Now Channel Up identified at 22-Dec-23:00. This pattern is still in the process of forming. 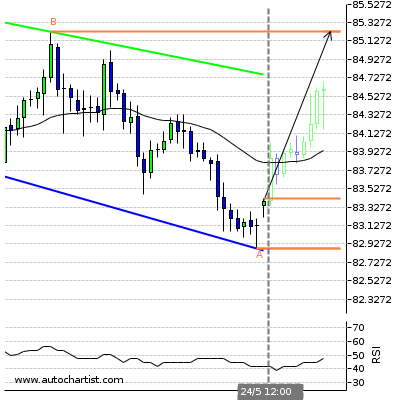 Possible bullish price movement towards the resistance 79.5155 within the next 2 days.